Clearly the pride and joy of it all! 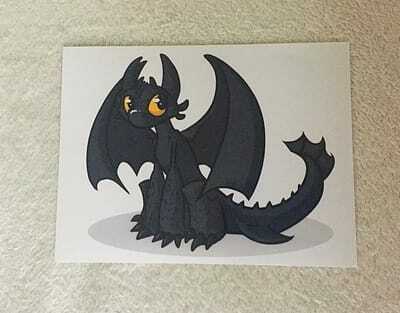 Yes, for my birthday I got a Toothless tattoo on my arm. 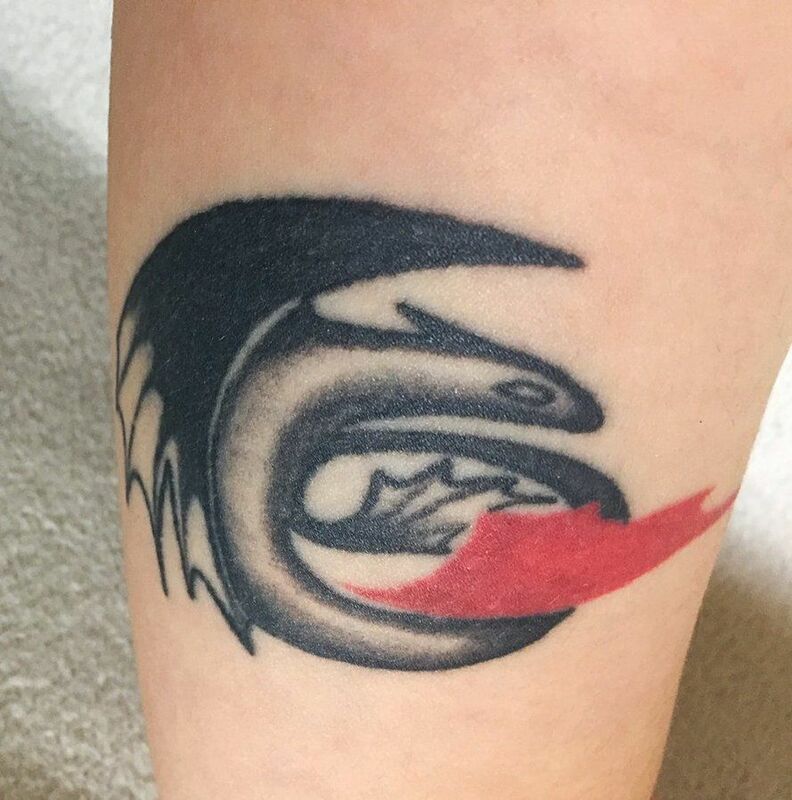 HTTYD is very important to me and this tattoo symbolizes the franchise and everything it means to me. It is absolutely gorgeous and I couldn't be more pleased with how he came out! 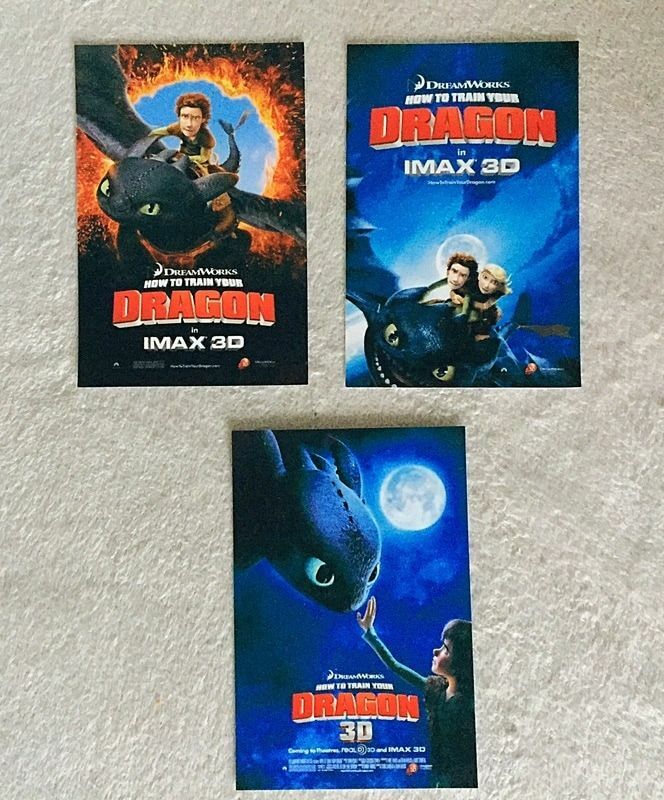 Now HTTYD will be with me forever! My devotion knows no limits. 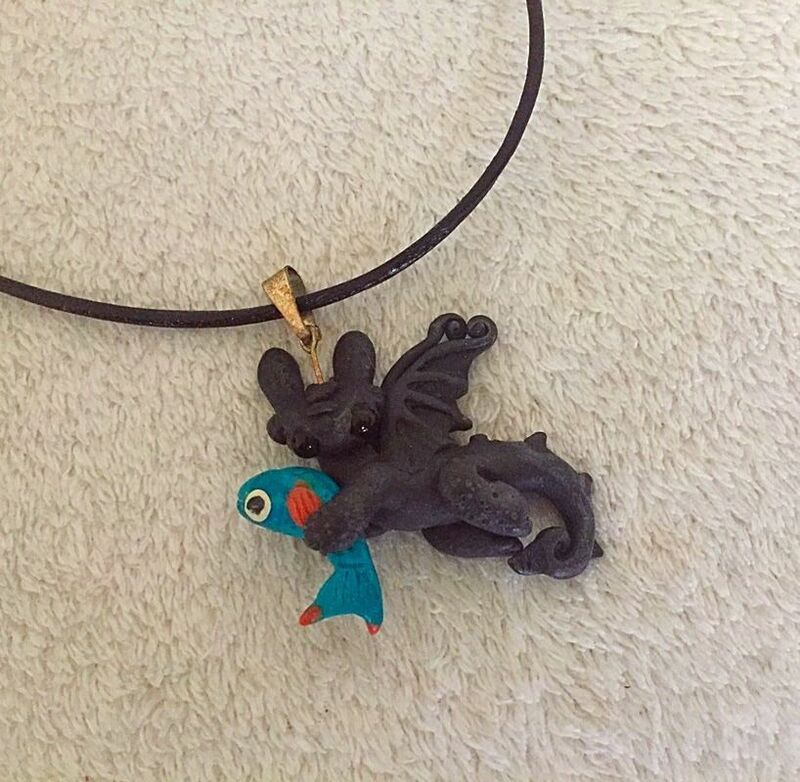 There is no necklace greater than this. It's not possible. 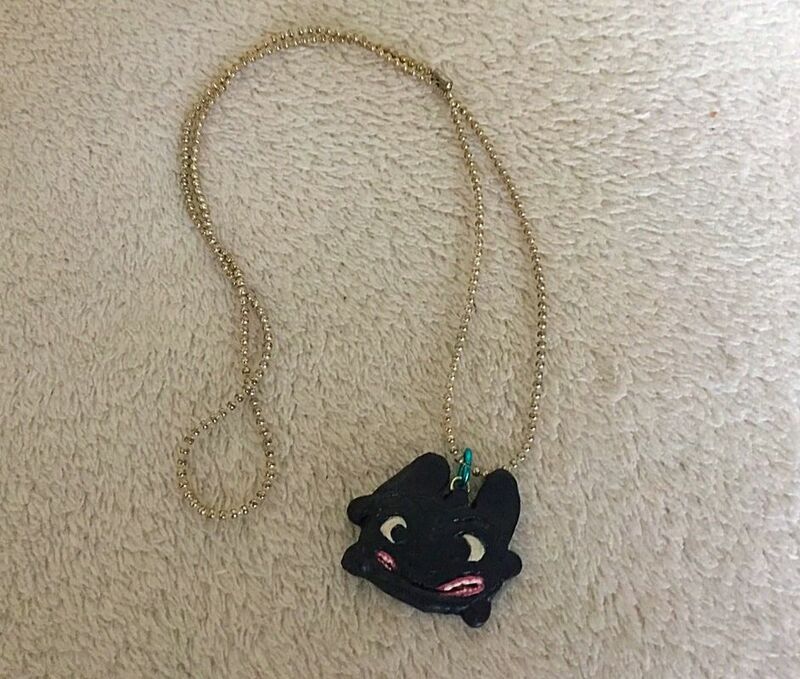 This is the best necklace to have ever graced the Earth with its presence. You can protest all you like with your cries of 'BHUT NIGHT FURIES'. They are futile. 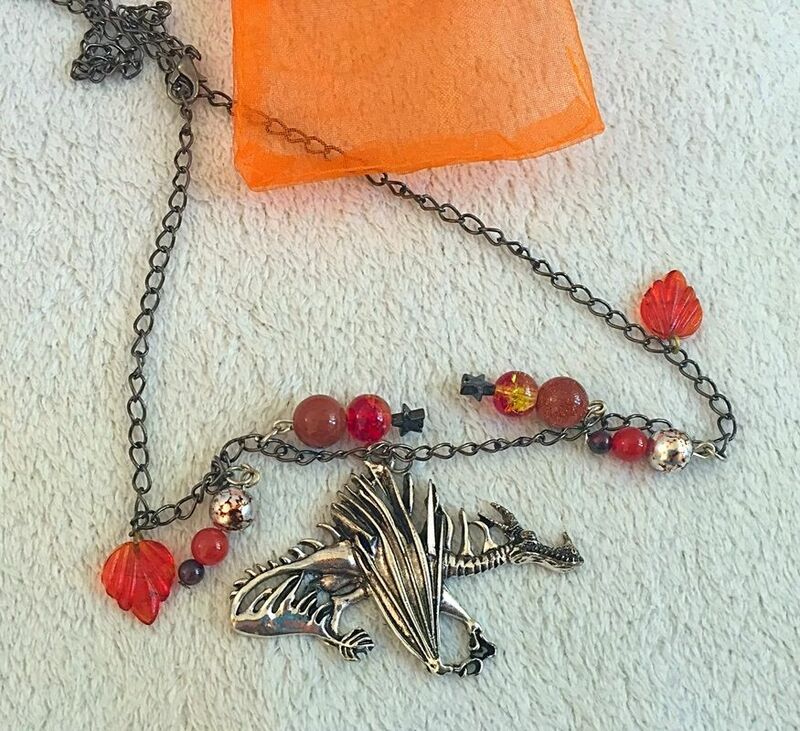 This beautiful, stunning, AMAZING Monstrous Nightmare necklace reigns over all. 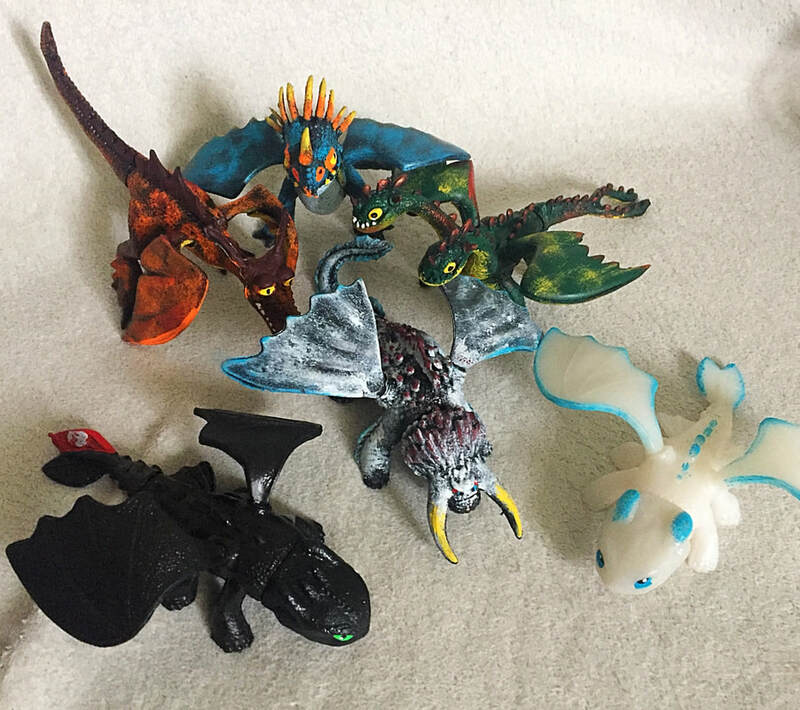 From its cute little flame charms, to the gorgeous glittery ones, to the METAL MONSTROUS NIGHTMARE. MY LOVE IS NOT WORTHY. Yes, this is my most favourite necklace of all time!! And with a new film comes a new favourite. I don't love him quite as much as Hookfang/Monstrous Nightmares, but Cloudjumper/Stormcutters proudly hold second place on my favourites! Poor Toothless has been bumped down to third. Didn't help that he was already over-powered and 'super special' before the second film, and now he is even more so. BUT ANYWAY Cloudjumper!! He is so cute and stuck up and I love it. So I thought, I don't have nearly enough Cloudjumper stuff. Why not get a lovely keyring? And so I did! And lovely it is! 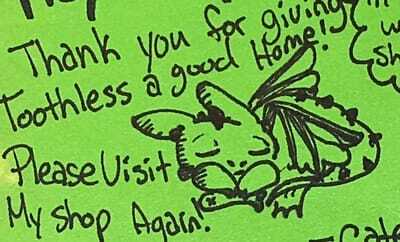 He looks beautiful here with his cute little pose, and the artist included some sketches too! What could be better!! He is made from foam mounted onto wood. The photo really doesn't do him justice! As soon as I saw this I went WANT IT, NEED IT, LIFE DEPENDS ON IT. It's stunning! 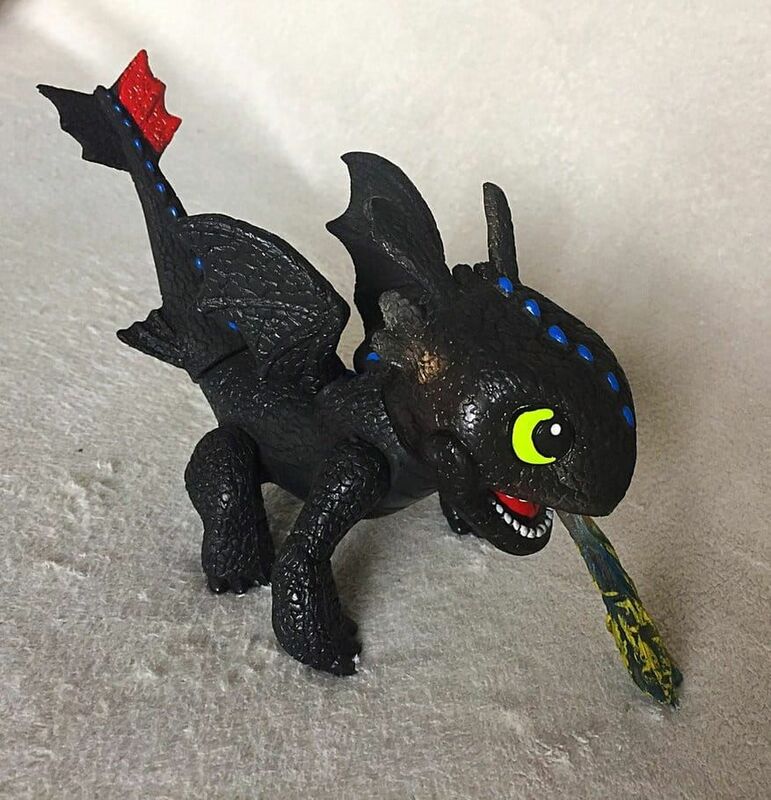 Toothless is looking adorable with his bead eyes, and he's wrapped around a beautiful heart that's either pink, yellow or purple depending on how the light hits it. Oh, and I'm a bit of a jewellery connoisseur, so I really enjoy hunting down nice necklaces and things. 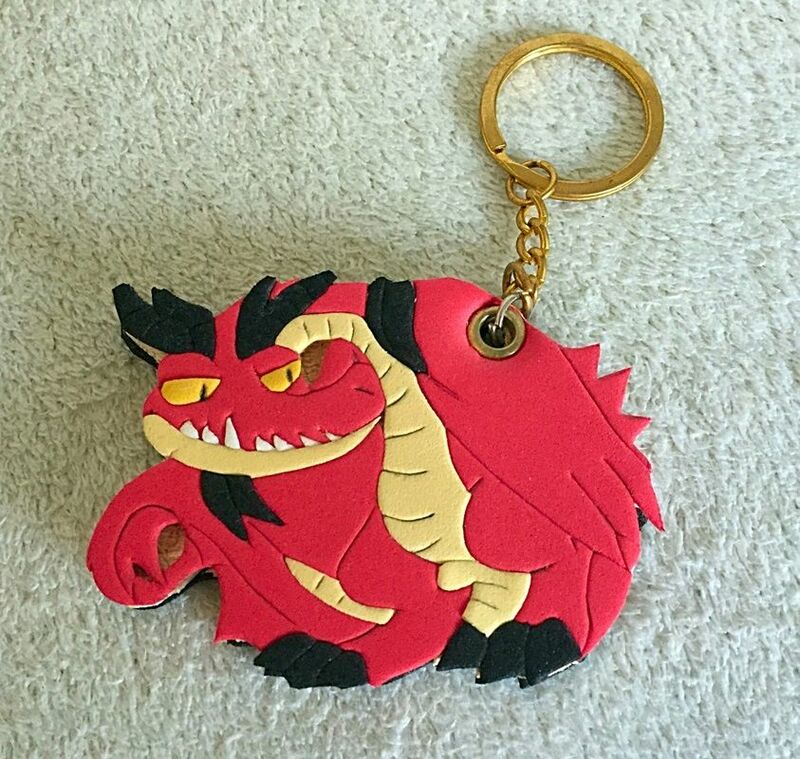 I couldn't resist getting another keyring! I just love this artist's style, and the way they make them out of foam (I think?) is really unique. 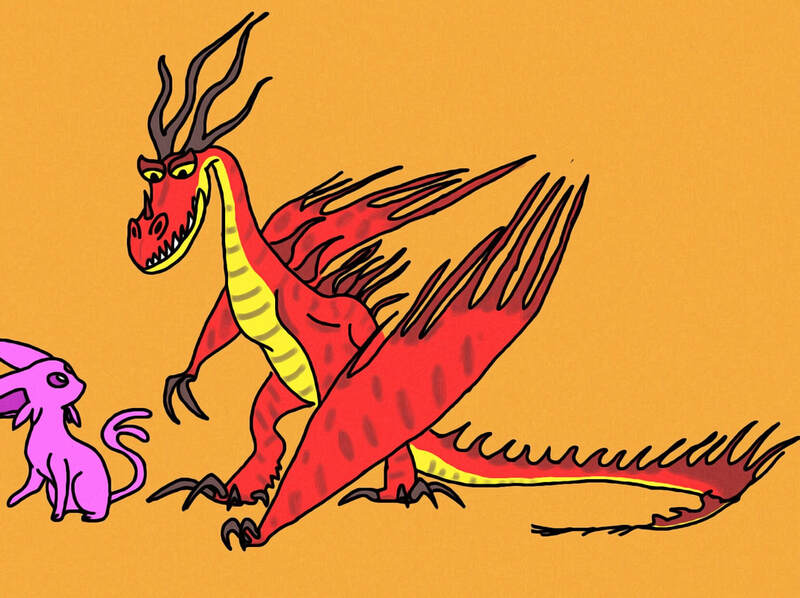 This time I went back for Hookfang, my one true dragon love. He's absolutely adorable, and when I hang him next to Cloudjumper they look like a mischievous duo! As per the artist's policy, I got his two original sketches too! Adorable! And the holy trinity is complete! 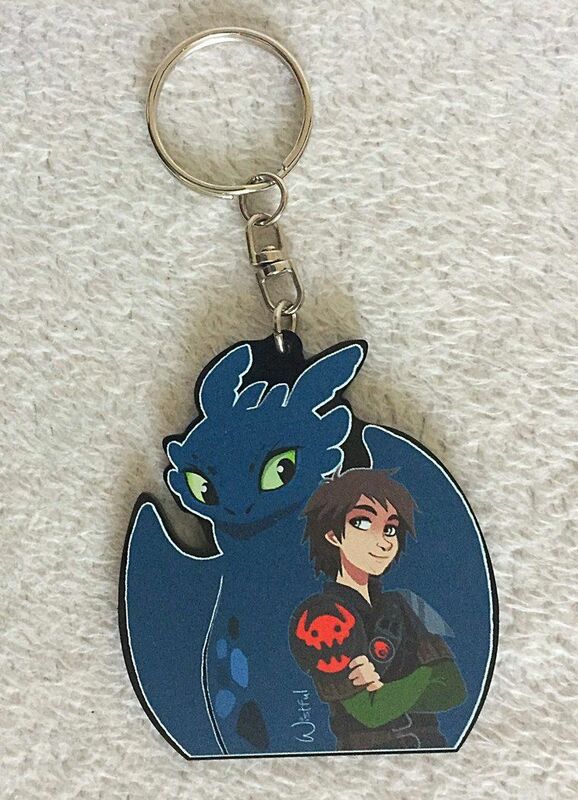 From this great artist I have my three favourite dragons in keyring form: Cloudjumper, Hookfang and (mega) Toothless! This guy is just as adorable as the others, and I love his cute sitting pose! 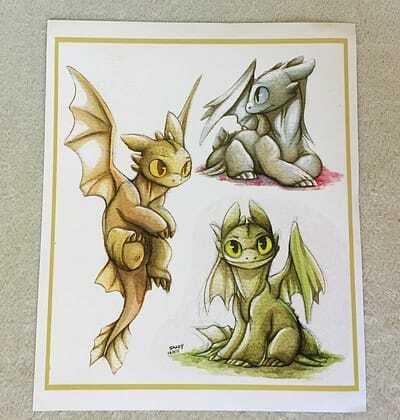 As before, the seller included the original sketches too! It's safe to say that I'm really pleased I got him, and he just looks too perfect hanging with the others! 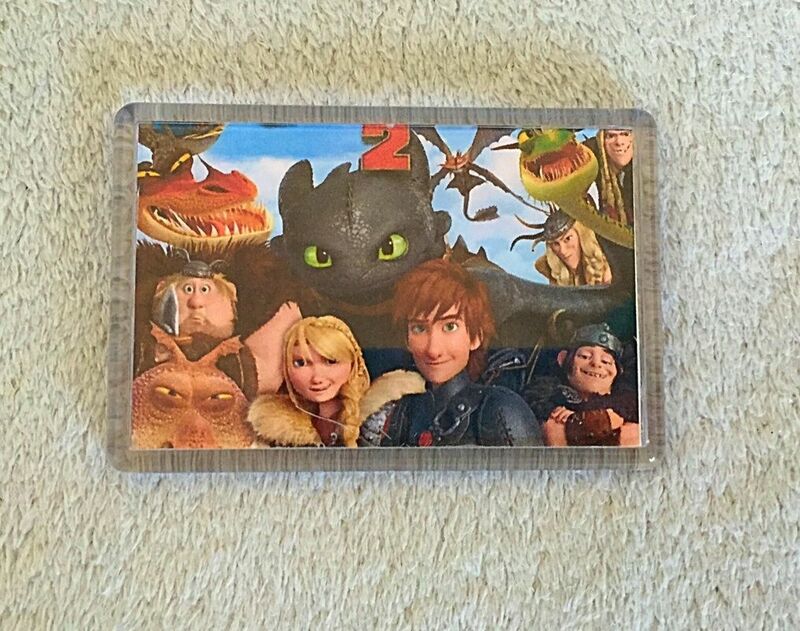 Isn't it weird when bootlegs are better that some of the official stuff? These figures have a very cheap feel to them, and they stink of cheap plastic, but they look really nice! 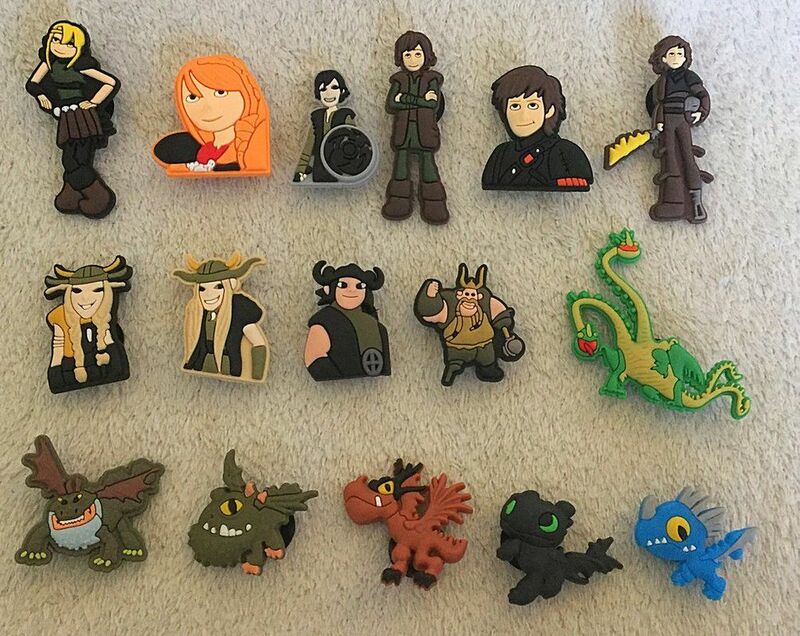 That's probably the best Bewilderbeast figure ever - sorry Spin Master, but your Bewilderbeasts were just ugly - and Hookfang and Belch & Barf are looking nice too. 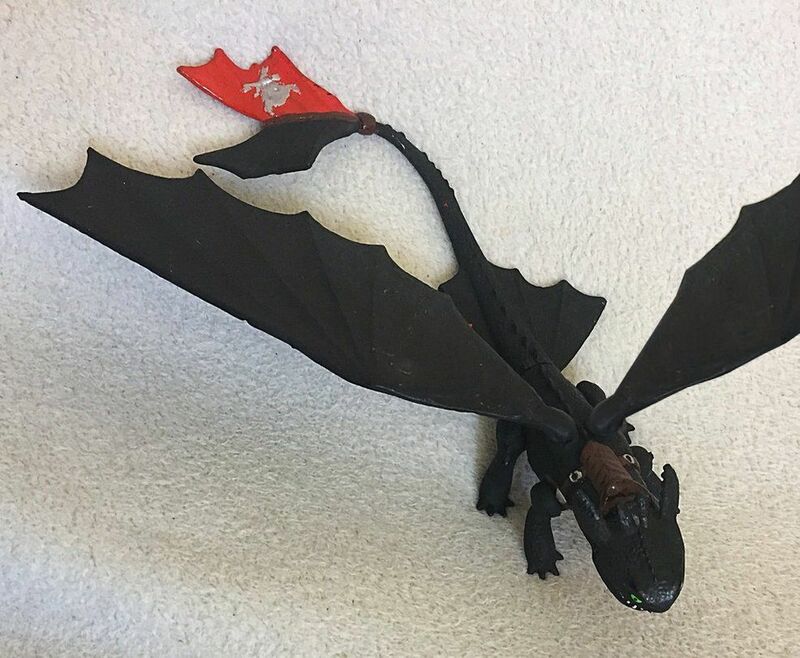 Light Fury is just a repainted Toothless, though. Can't win 'em all I guess! Look at this beauty! Really, admire it for a few minutes. Let all those details sink in. Pyrography is a tricky art because it takes a steady hand, and one tiny mistake can render the whole project moot. So I really love how perfect this is! 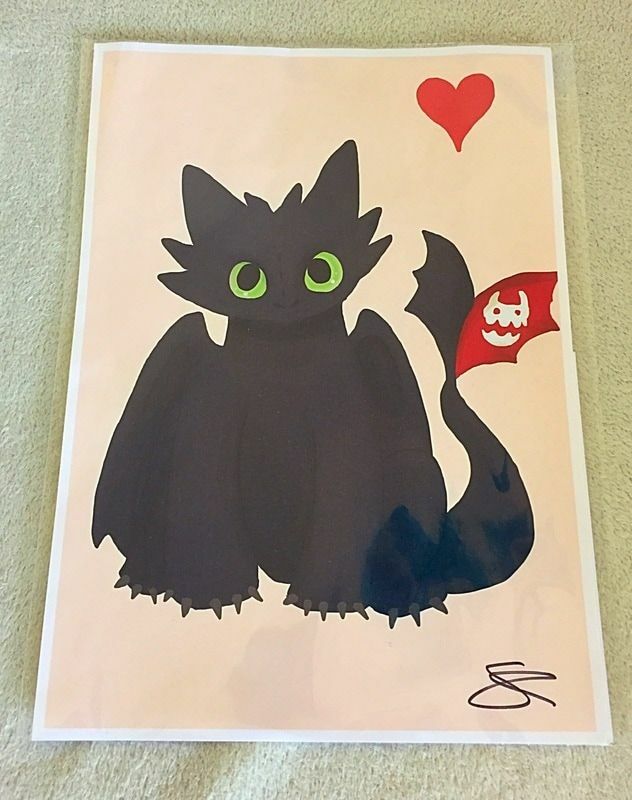 I commissioned it, just asking for one Toothless, but the artist kindly went above and beyond that! I use it to store bits and bobs, like my work memory sticks. 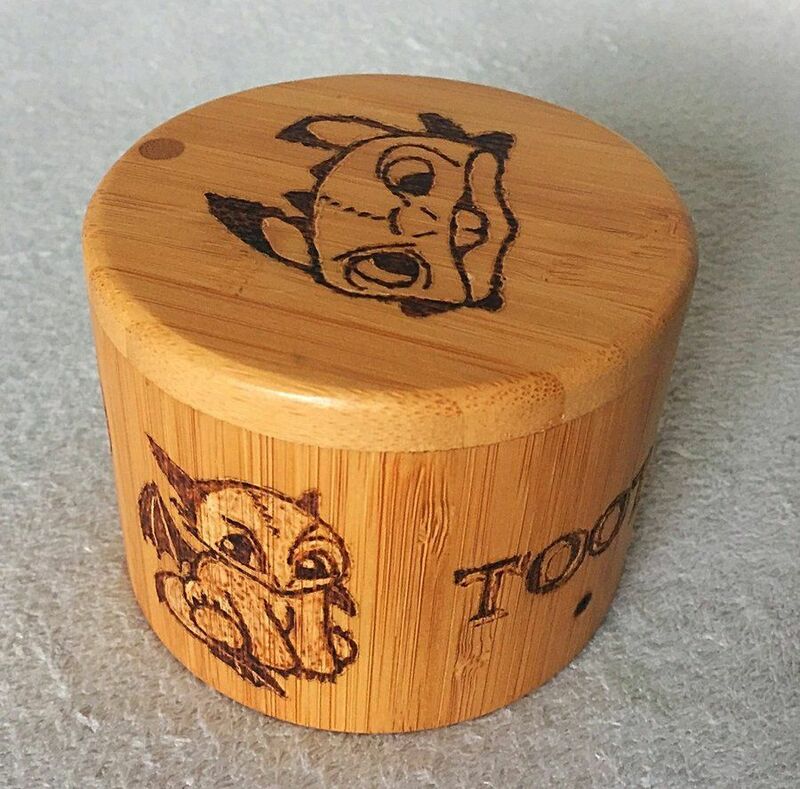 It has Toothless on the lid, side and his name across the front, as well as Hiccup on the other side. The back says it's made for me! This is truly a one-of-a-kind piece, I'm very happy and lucky to have it in my collection! Check out what my colleague made me on her last day before she left! Isn't he a cutie? 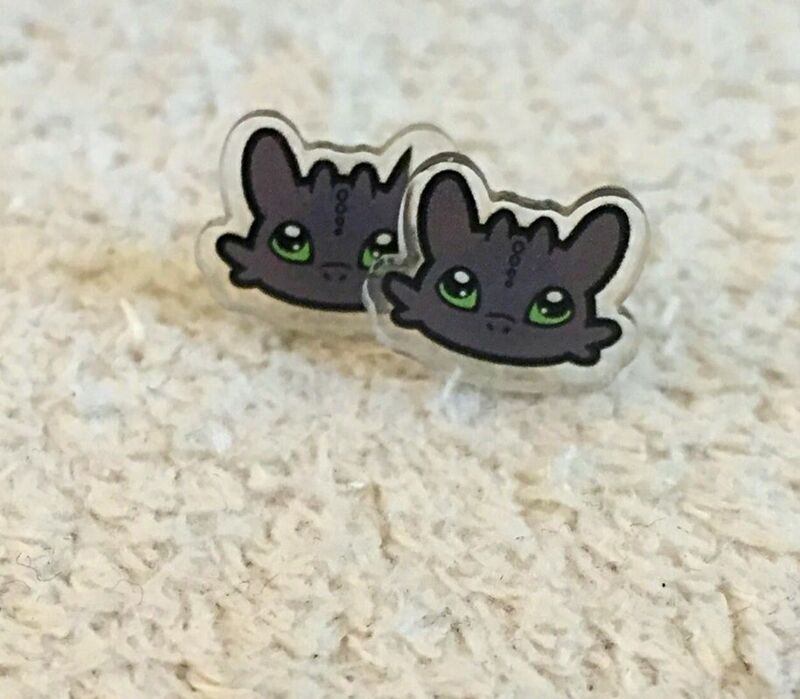 I love Toothless; this was very thoughtful of her! I'm truly touched! He looks a little derpy from the front (in an adorable, good way mind you!) but he looks amazing from the back! 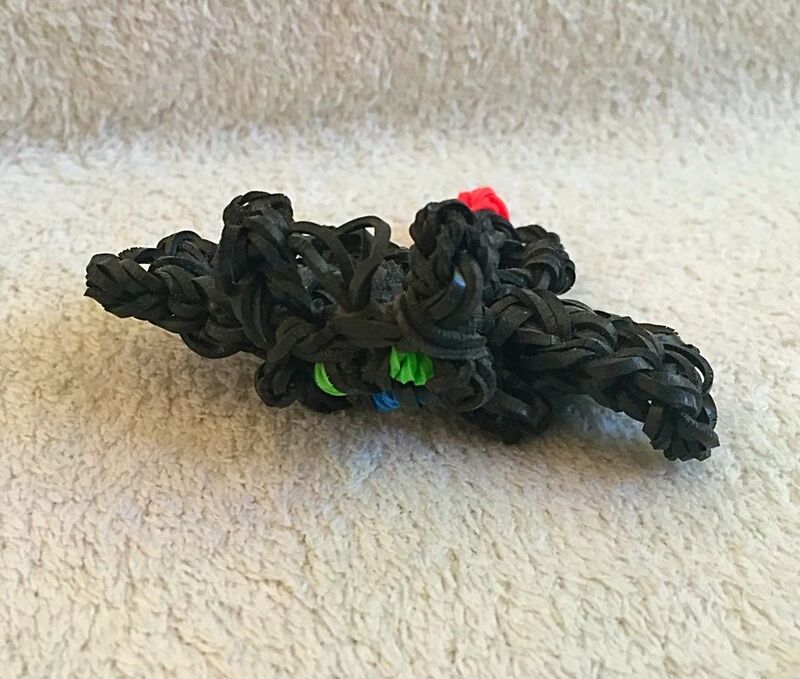 I can't understand loom bands to save my life, so to see someone make a fully 3D Toothless is amazing! 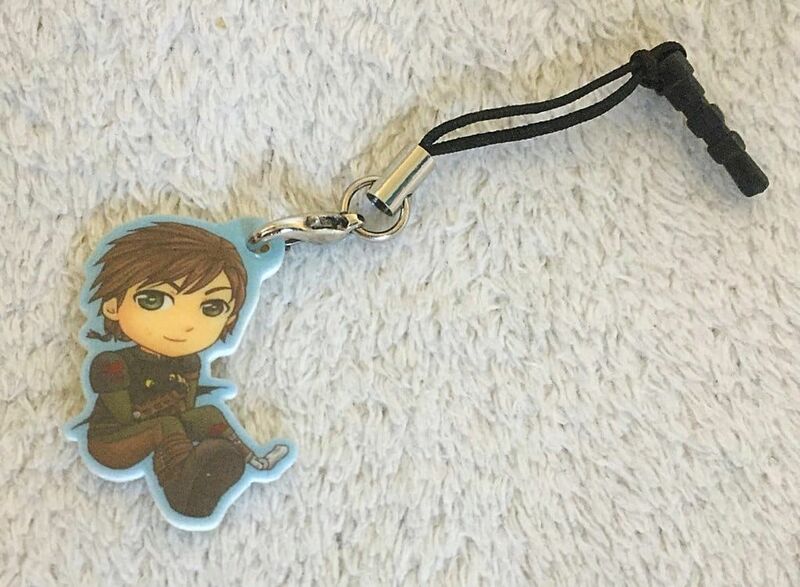 He comes with a little loop to attach him to stuff, but I wouldn't dare risk damaging him. This item is absolutely gorgeous and could pass for something official, but I don't think even the official stuff is this high quality! I absolutely love the stained glass effect on the back. 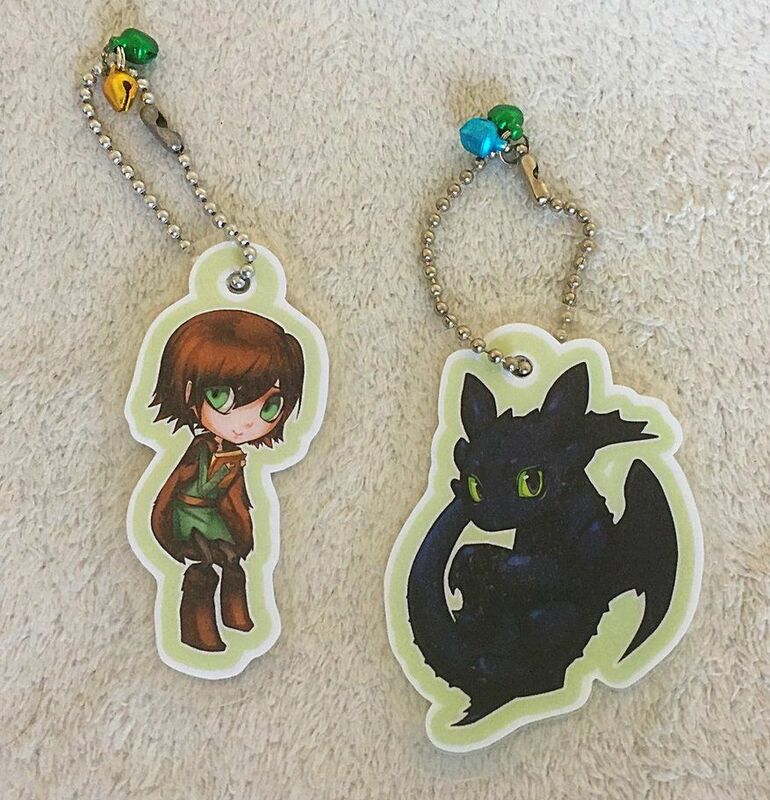 Hiccup and Toothless look so noble! This was a wonderful gift from a wonderful person! I love it so much, I can only bear to wear it once because I don't want to picture to fade. It's seriously beautiful. 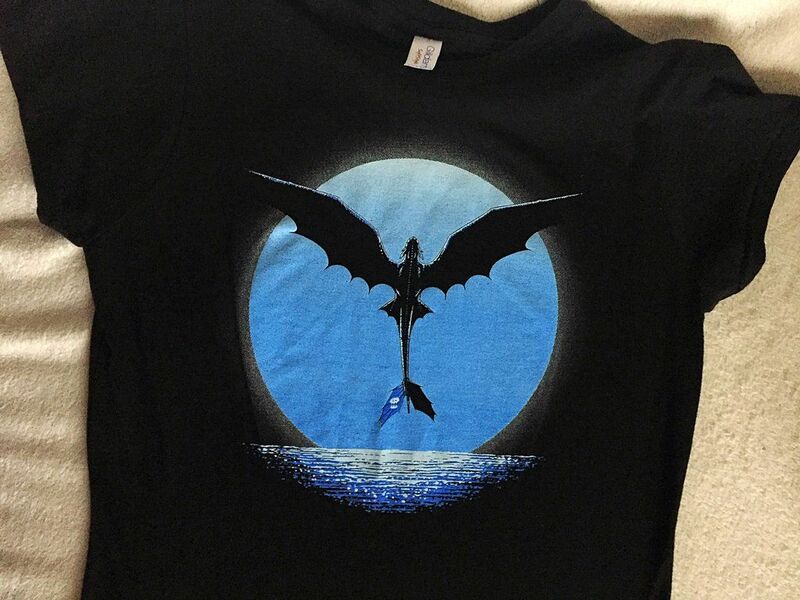 Toothless silhouette, moonlight/ocean combo and blue? Three of my favourite things! What is this? 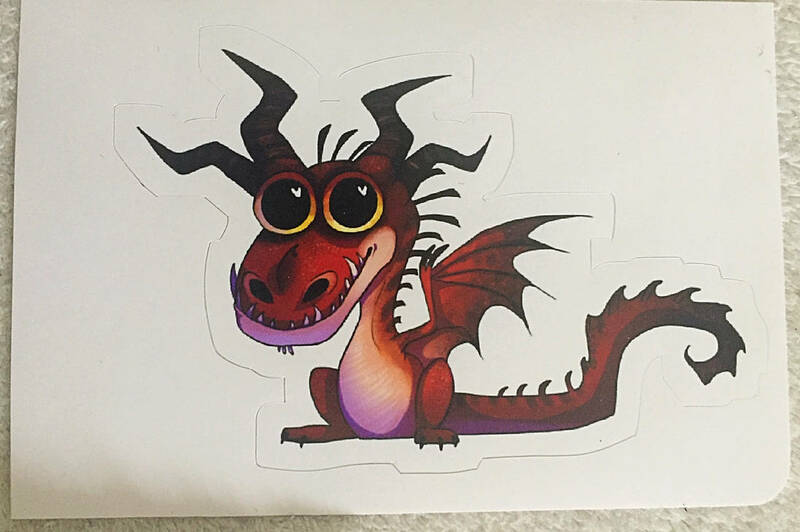 Only the cutest patootiest sticker in the world!! This was a gift from a close friend and I'd be lying if I said it wasn't one of the best damn gifts I've ever received. It's just so cute!! Too cute!! A lot of people probably just see a fierce, grump dragon face, but I see the cutest lil bad-tempered thing around. 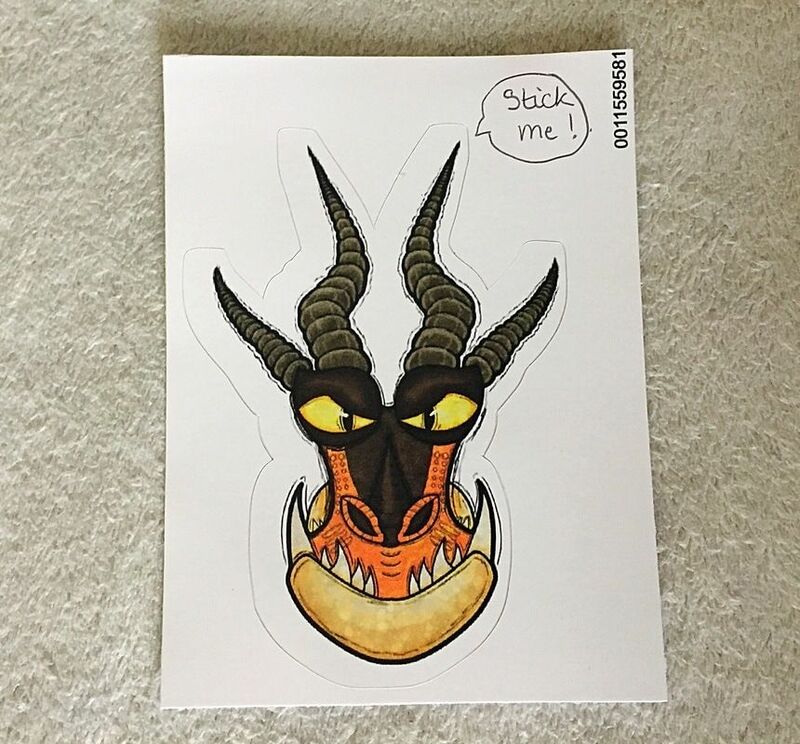 Hookfang is asking me to stick him somewhere, but first I need to find somewhere appropriately amazing for such a great sticker. 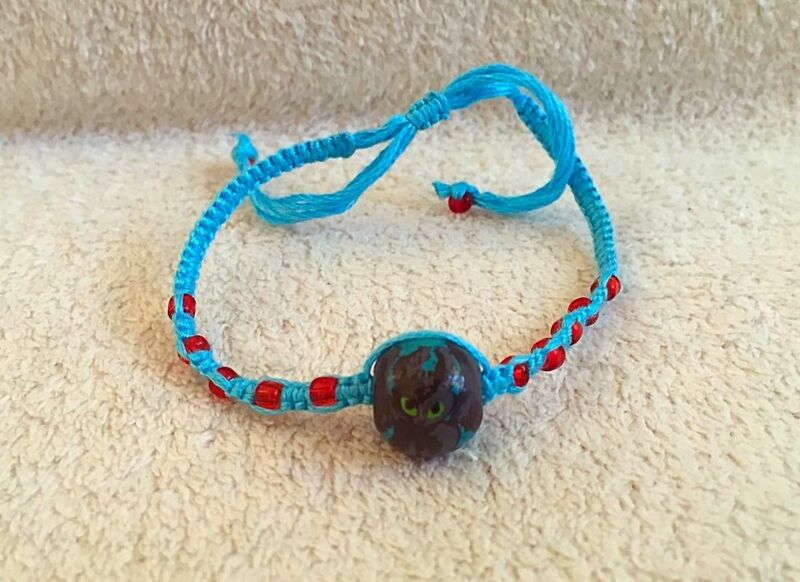 You don't see many bracelets around! I love the detail on this little one! The colours are charming, too! These are just lovely! Easily some of my most favourite custom items! 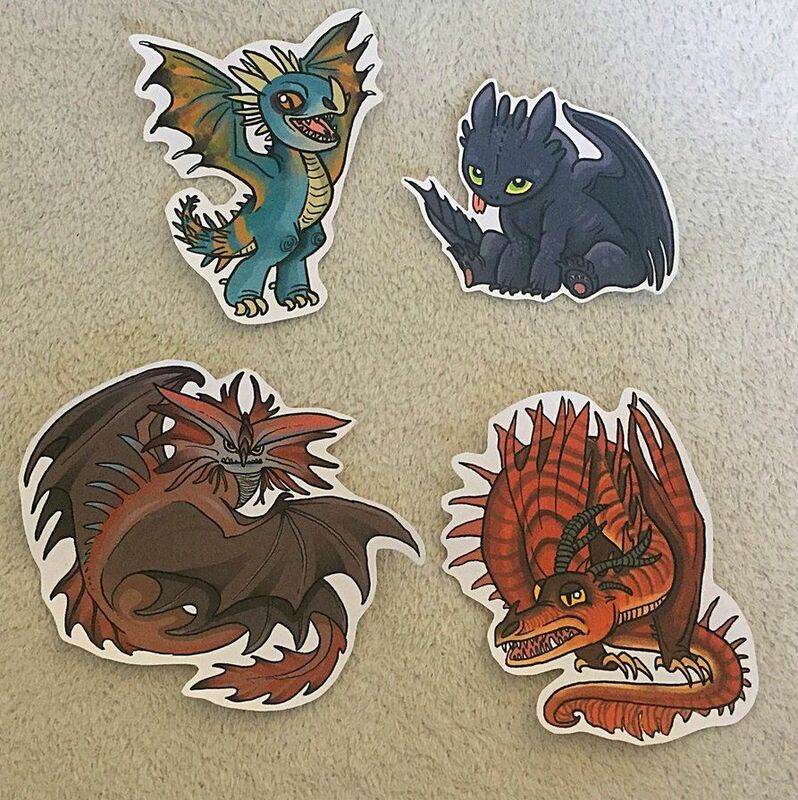 Here I have my top 4 favourite dragon species, all in glorious sticker form! That Monstrous Nightmare is amazing, look at its perfection. 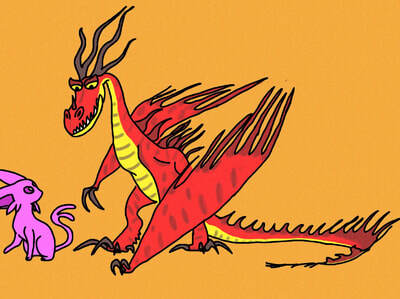 Always my favourite dragon!! Cloudjumper is similarly flawless! 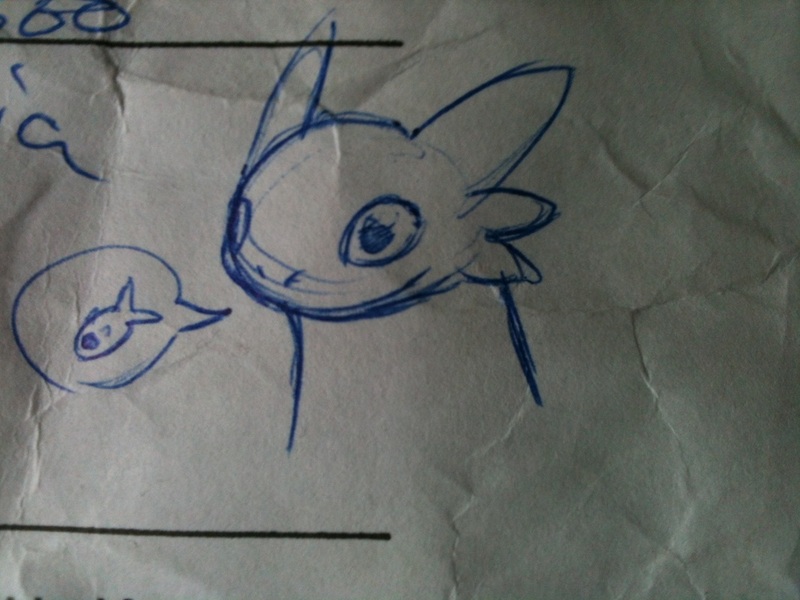 This particular artist is popping up a lot on this page, but for good reason! Their art is just so adorable! 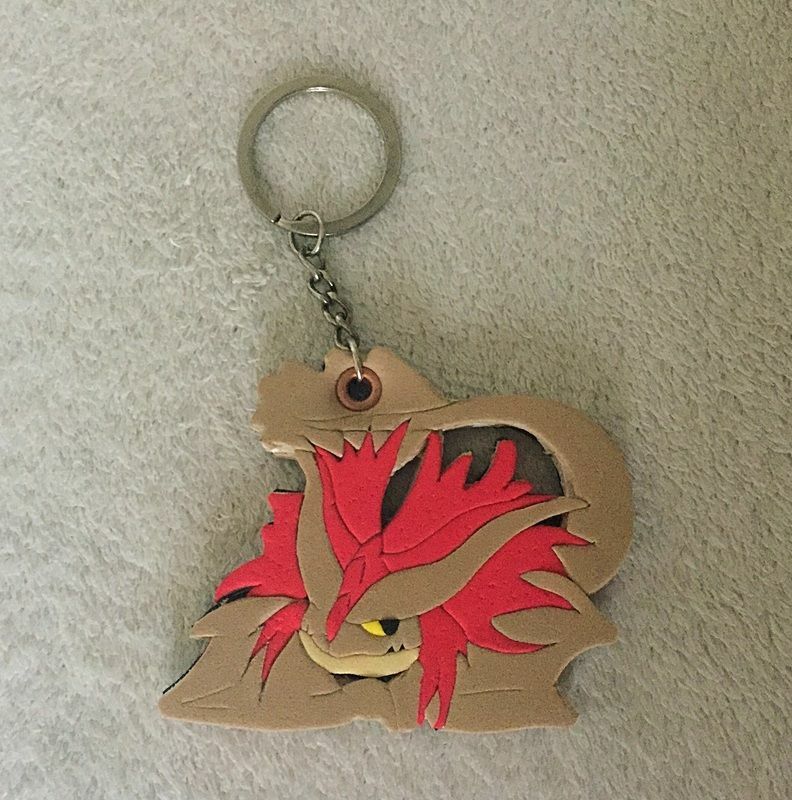 This keyring is nice and sturdy and very high quality. Look at how cute those best buds are!! Such a precious little baby!!! I love him!! 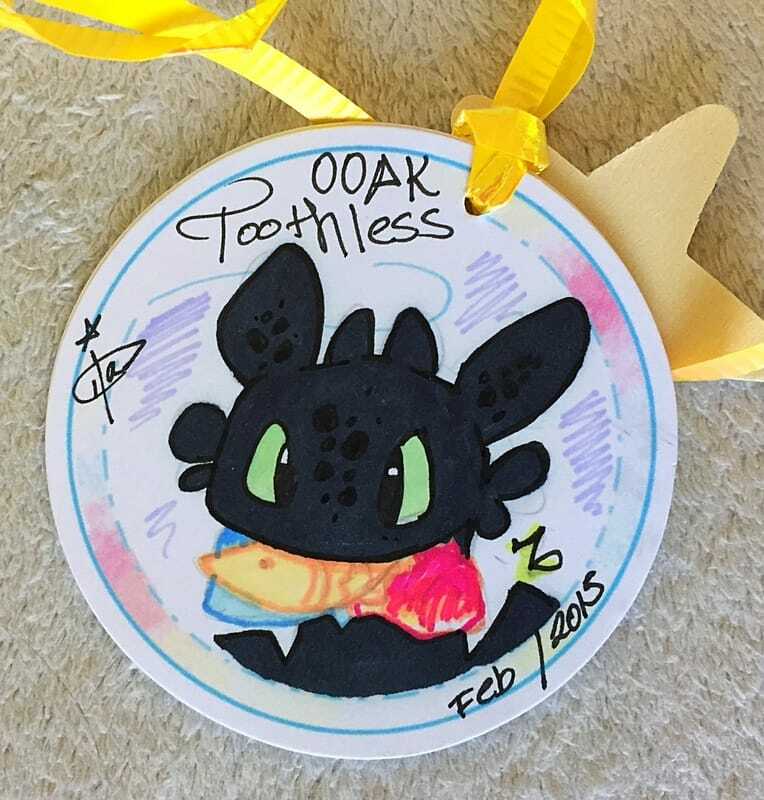 This was a gift from my best dragon friend, who somehow always finds me new, cute Hookfangs to add to my hoard! 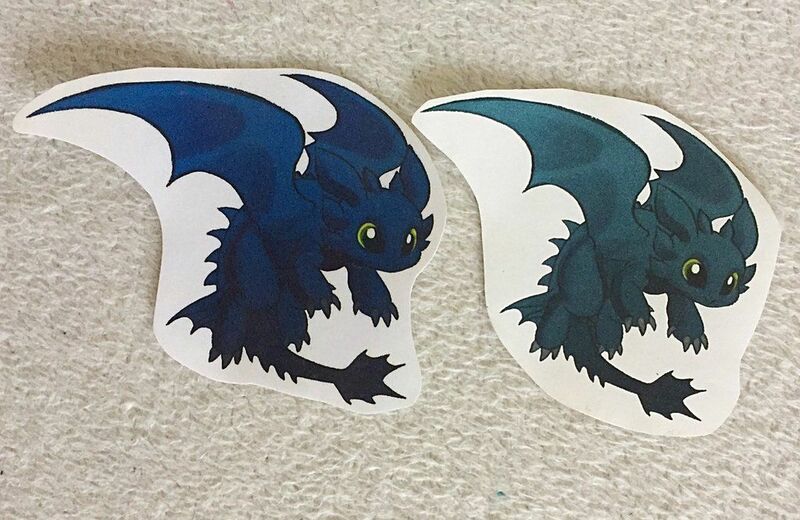 This Hookfang may just be the cutest so far, he's ADORABLE! These are the best earrings ever, and no one can convince me otherwise. I seriously love them, and don't think I'll ever need any other earrings, because these are just too perfect! Look at that cute little face... I'm so in love! 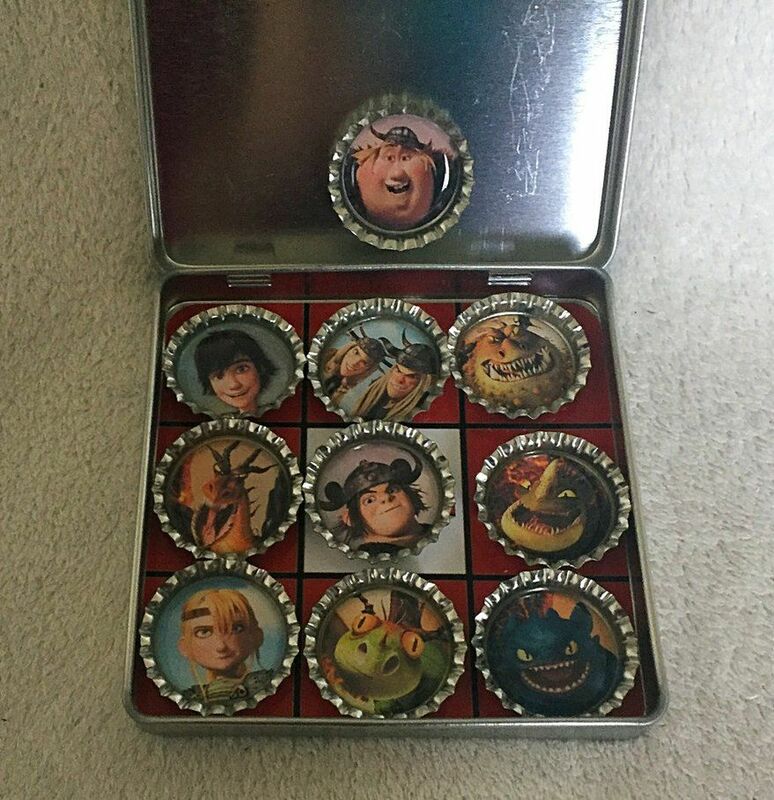 These were the best gift ever! Such little cuties! They even have colour matching bells! 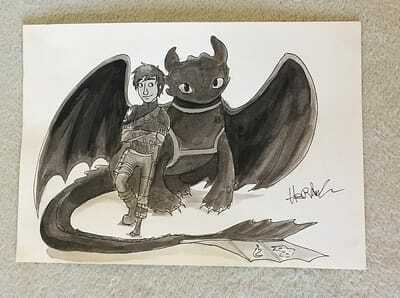 I commissioned this from a lovely artist at London Comic Con 2012! He's so cute, and one of a kind! More stuff to love! 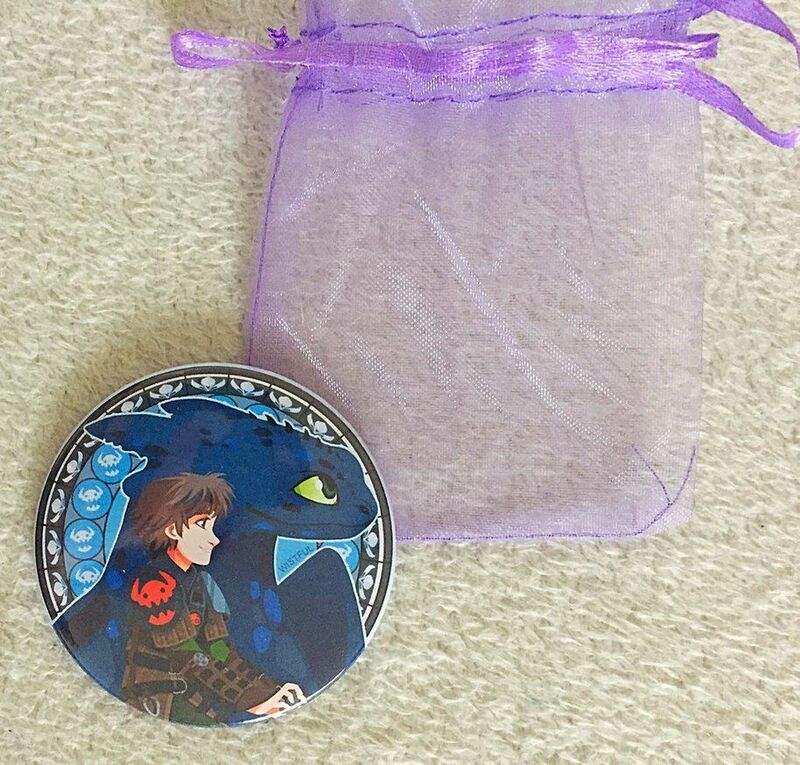 The badges on the felt are glittery and cool. The badge on the side is plain. Cute cute cute! 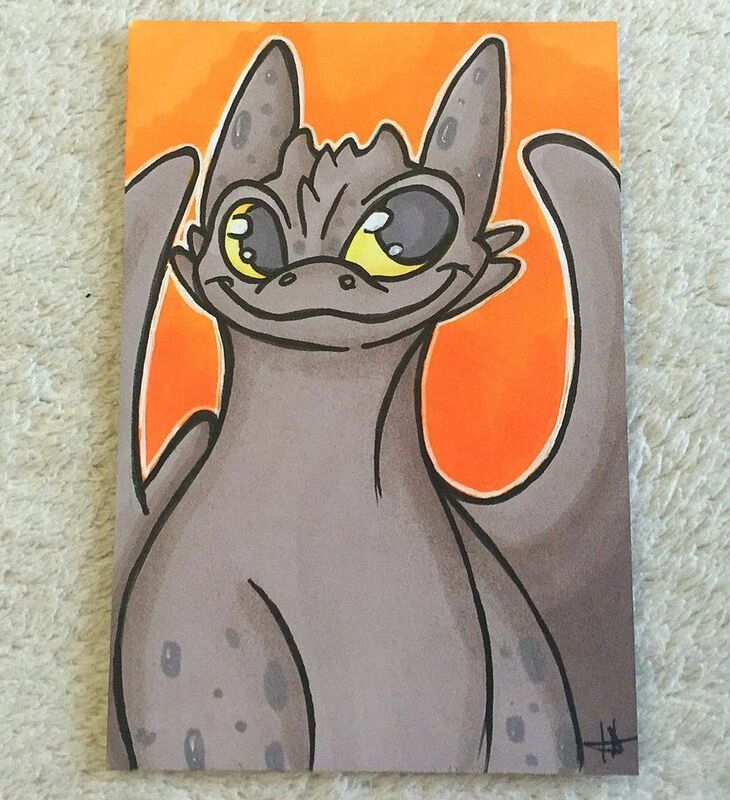 Another ACEO! This one's of Hiccup. I got him from a charity auction for March of Dimes. He looks so adorable holding that book, and I got to help a good cause! It's win-win! 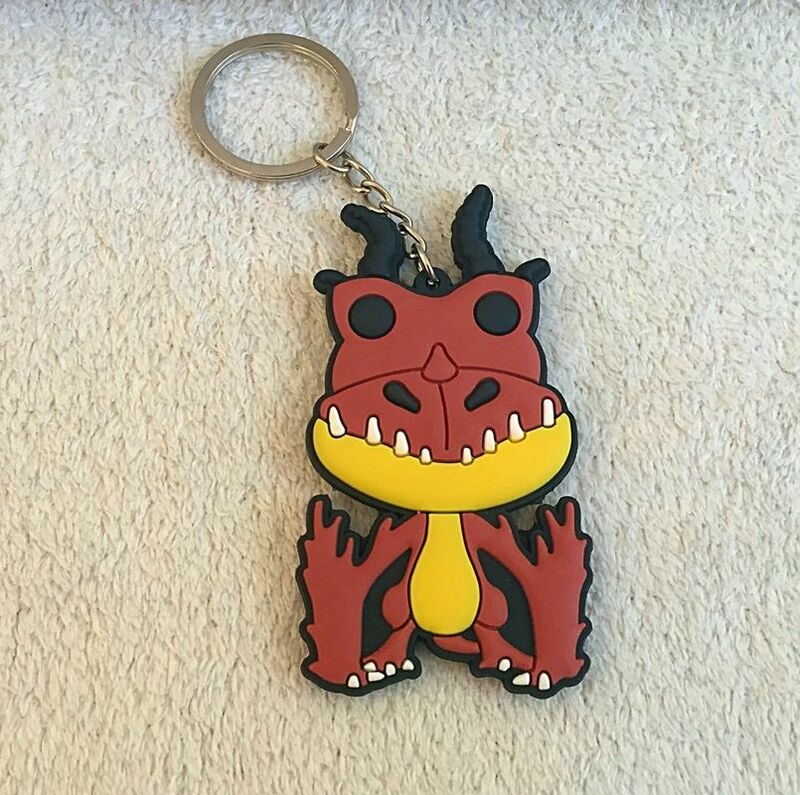 This keyring was super cheap and from a Chinese seller (ripped off the Funko Pop art), so I wasn't expecting much. 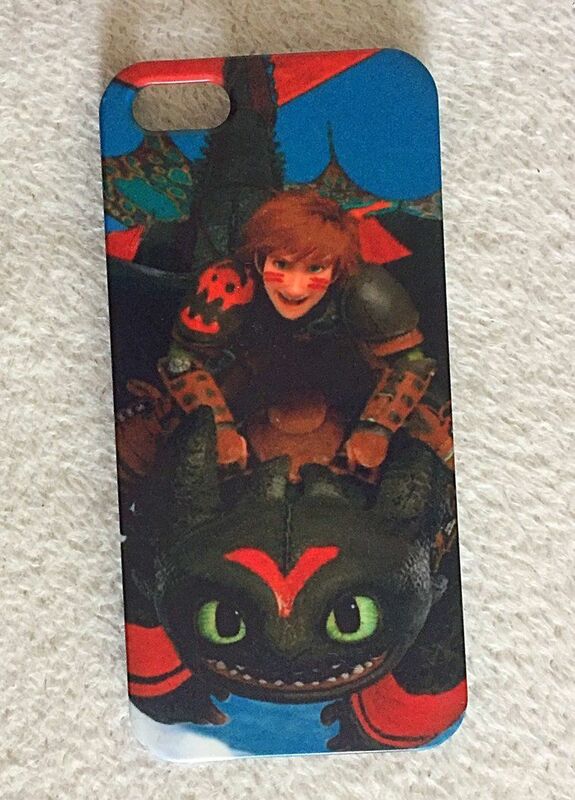 Imagine my surprise when this keyring arrived in its huge and double-sided glory! Yep, this is an amazingly high quality item, considering its price and origins. 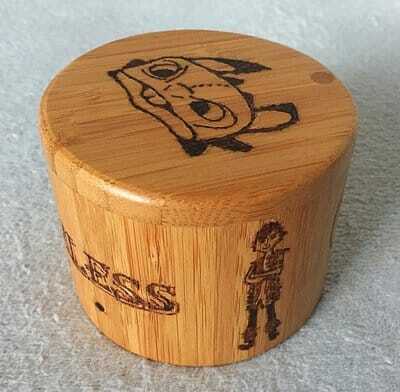 It's actually better than some official merchandise! 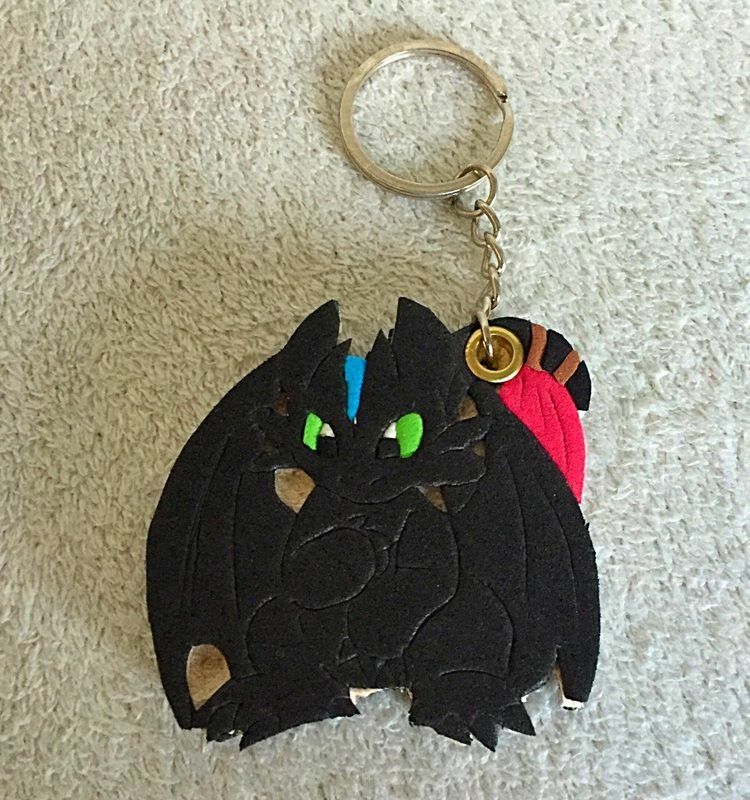 I actually love this to pieces, it's become one of my favourite Hookfang items. I'm so pleased I bought it, worth it for sure! What a cute little baby!!! 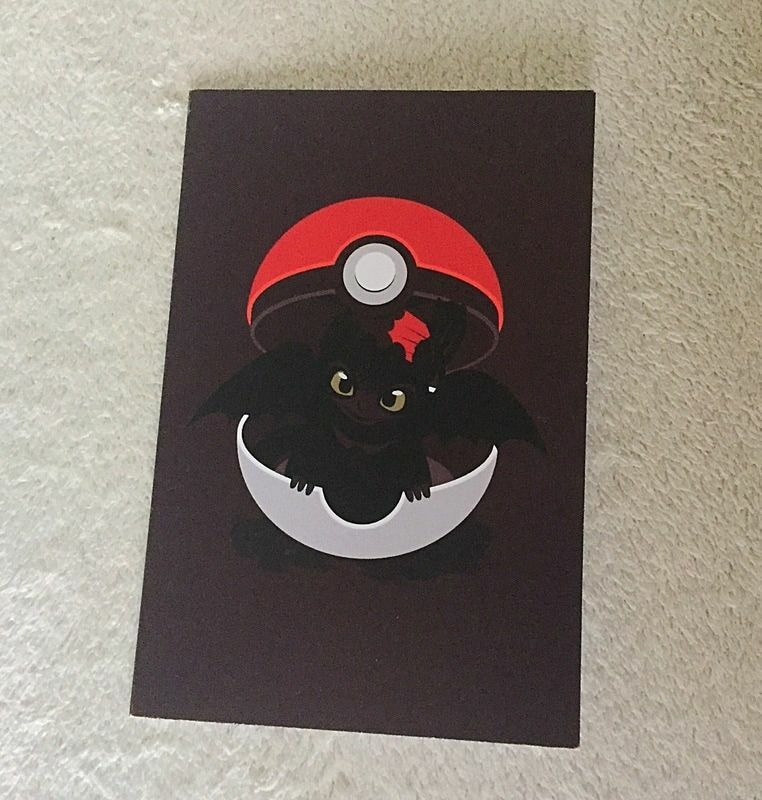 My close friend had this made for me, and I think it's the cutest thing on the planet. Baby Hookfang eyeing up a chicken leg? My heart can't take it!!! I wish I could adopt him and give him all the chicken he wants. A very simple design, but there is beauty in that simplicity! It's a beautiful print that would look stunning as an art piece! 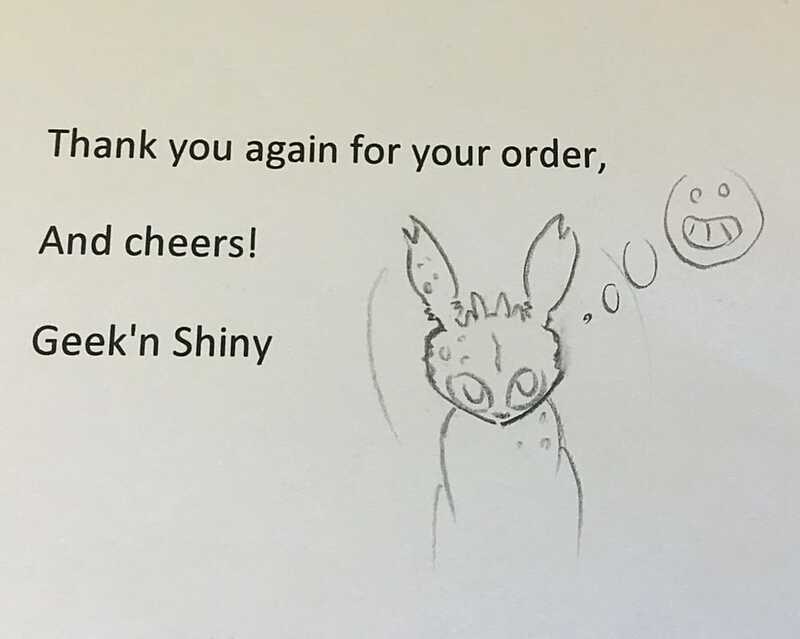 This was an unexpected gift, and I love it! It matches my keyring and pocket mirror, and is made by the same artist. 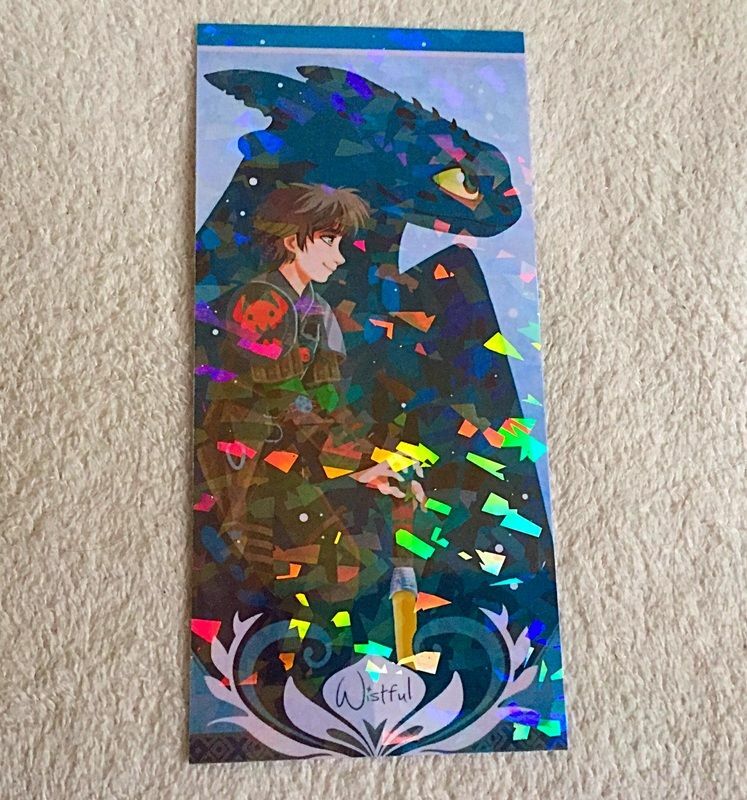 It's a decent sized bookmark, with one side beautifully shiny and the other side normal. 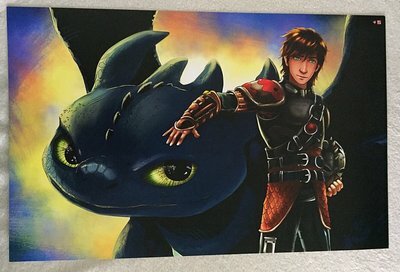 I love this art - Hiccup and Toothless look so noble together - so I love having it in pretty sparkly form! I bought this not knowing if it was official or not, but I don't think it is. Either way, it's very well made! It's huge and sturdy and is made from a wonderful scaly material! 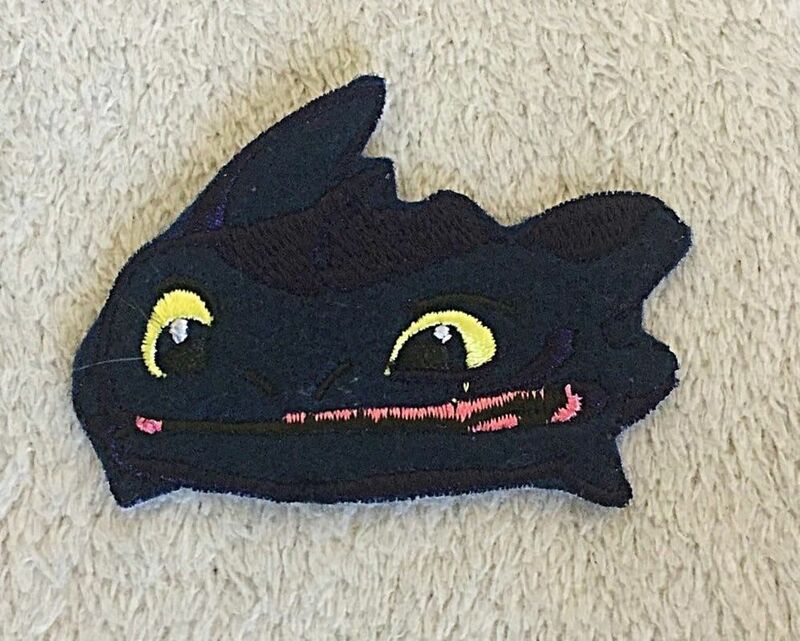 And of course, Toothless' face is just too cute! Not sure about zipping open his skull to put my money in though, hmm. 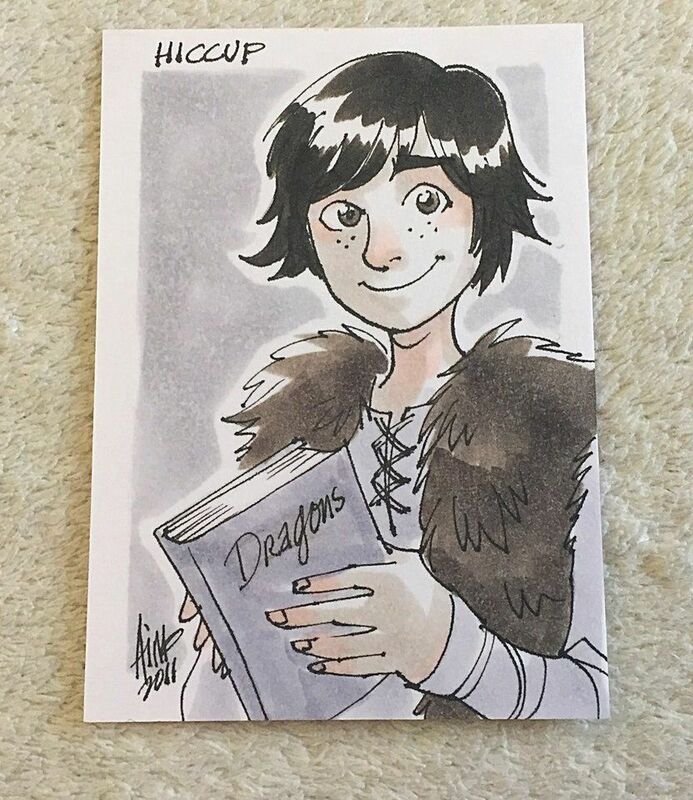 Older!Hiccup, from HTTYD2. 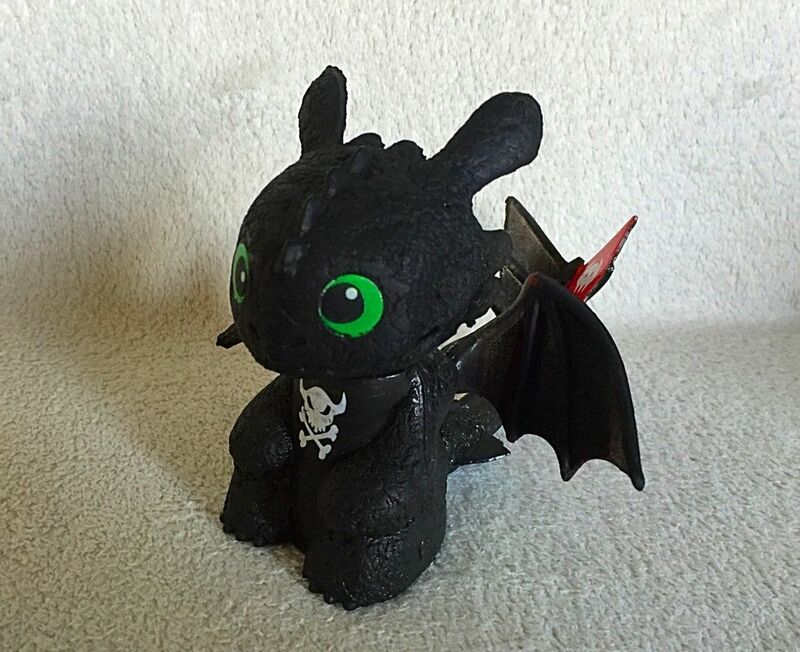 He's even holding a tiny Toothless! I don't think that's how dragon growth works but okay. So cute! So cute! 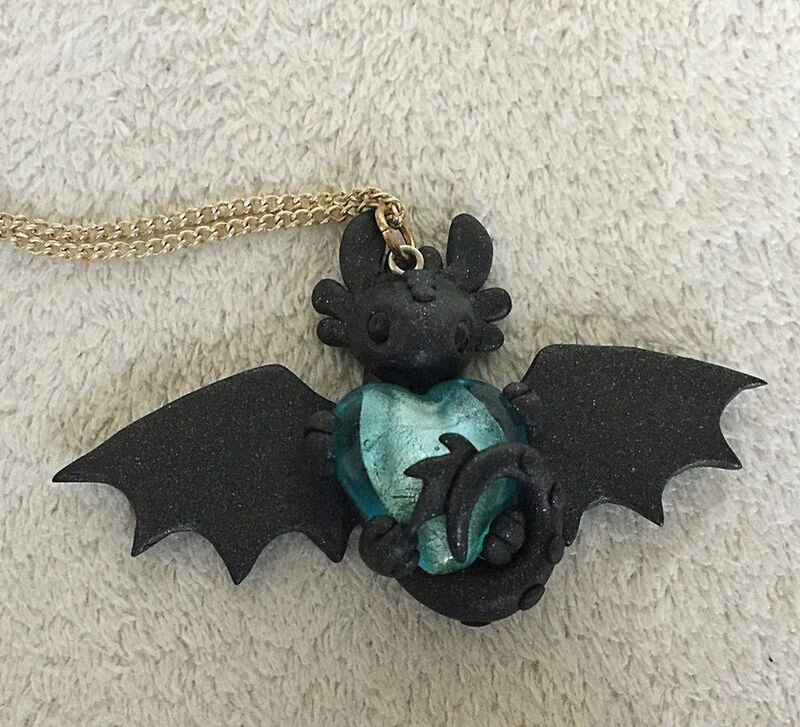 I like the wings on this Toothless more than the other necklaces, and he's glittery to boot! Blue is my favourite colour, which is why I wanted this one more! These are crazy expensive on eBay for some reason, but luckily I got mine on a cheap offer. I was reluctant to buy it, but it is pretty cute and I like his eyes a lot! 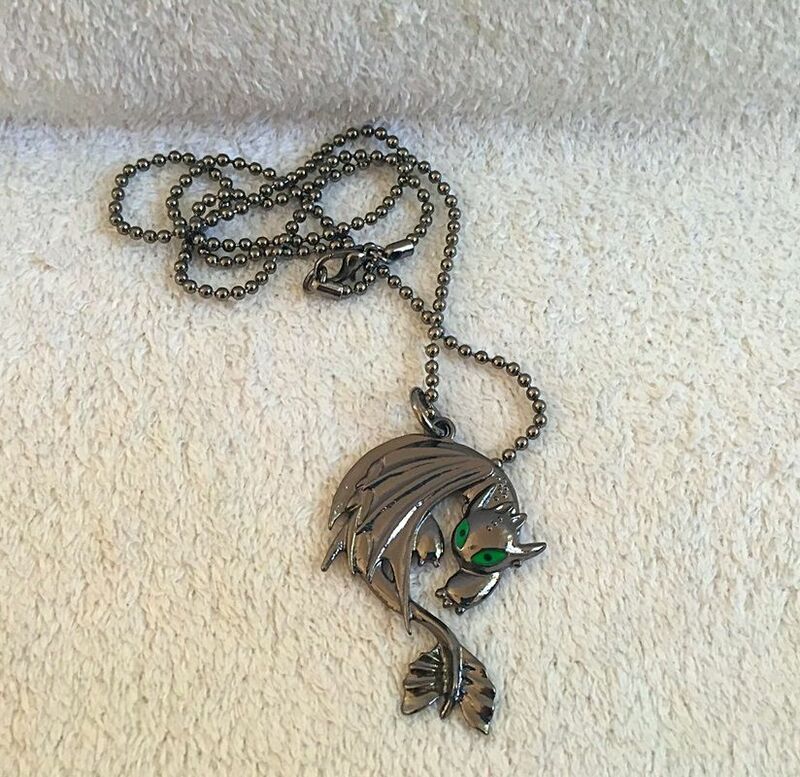 The metal isn't amazing quality though, so I doubt I'll be wearing it. 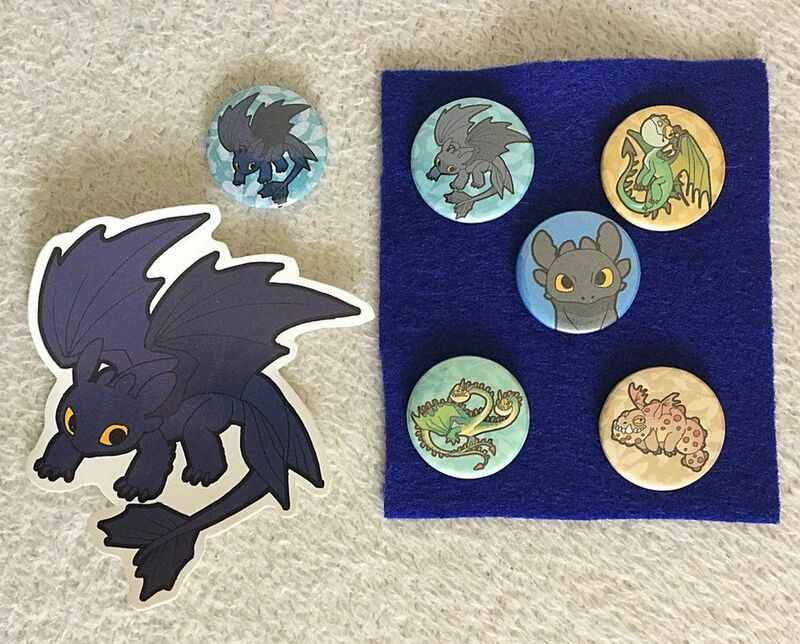 ​Cute lil badges! 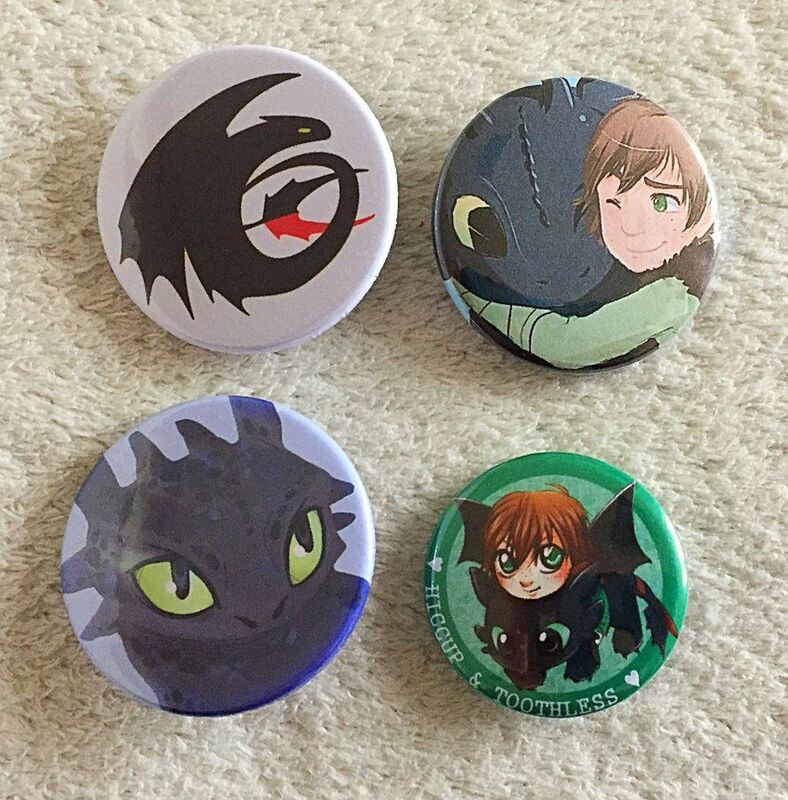 All of these are super cute, but I especially love the Hiccup and Toothless ones! 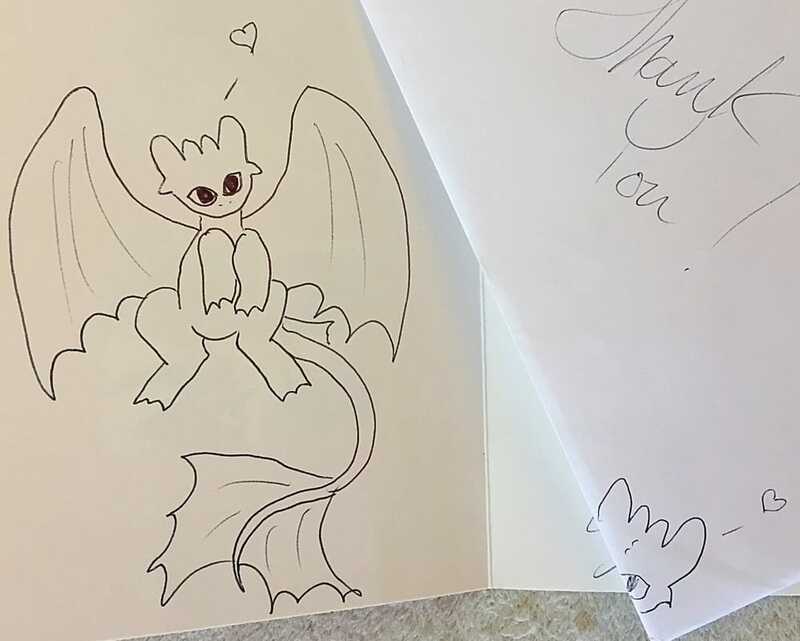 Down below is my most recent one; my dearest dragon friend sent it to me after I'd had a particularly rough couple of months! 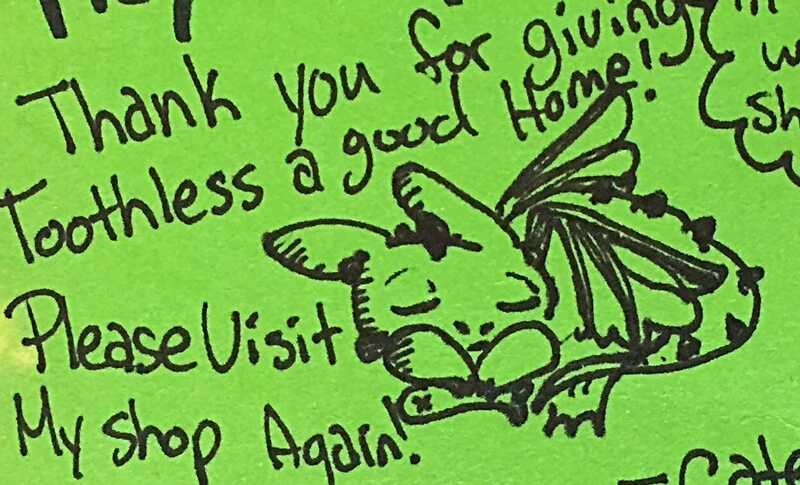 The art is so, so cute! Look at that little Terrible Terror peeking out! This is a weird book, guys. It came from Japan, but it's got a weird mix of official art and fanart. I think it's just a bunch of HTTYD-related art grouped together and printed into a probably-not-official book. 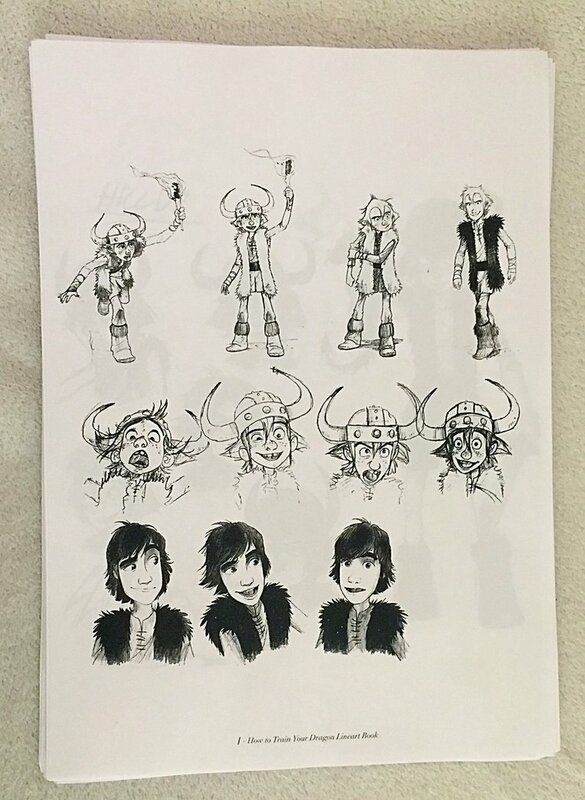 Still, the fanart is super cute and the official art is quite nice - storyboards for the TV series included! I got this off eBay super cheap, because how could I resist? Cheap price? 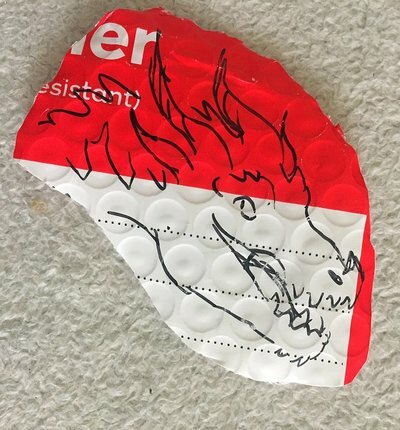 Awesome detailed Hookfang? A match made in heaven! 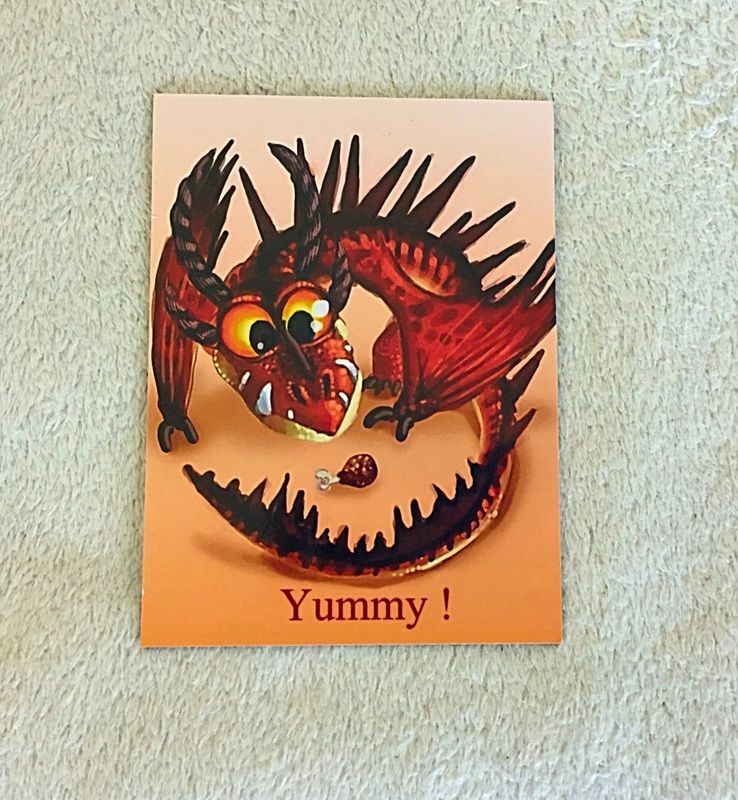 Look at his gorgeous, fiery colours! I don't want too many crazy Mexican bootlegs, but this guy was too cute to pass up. His sitting pose is so cute, and his wings and tail are actually really nicely shaped! 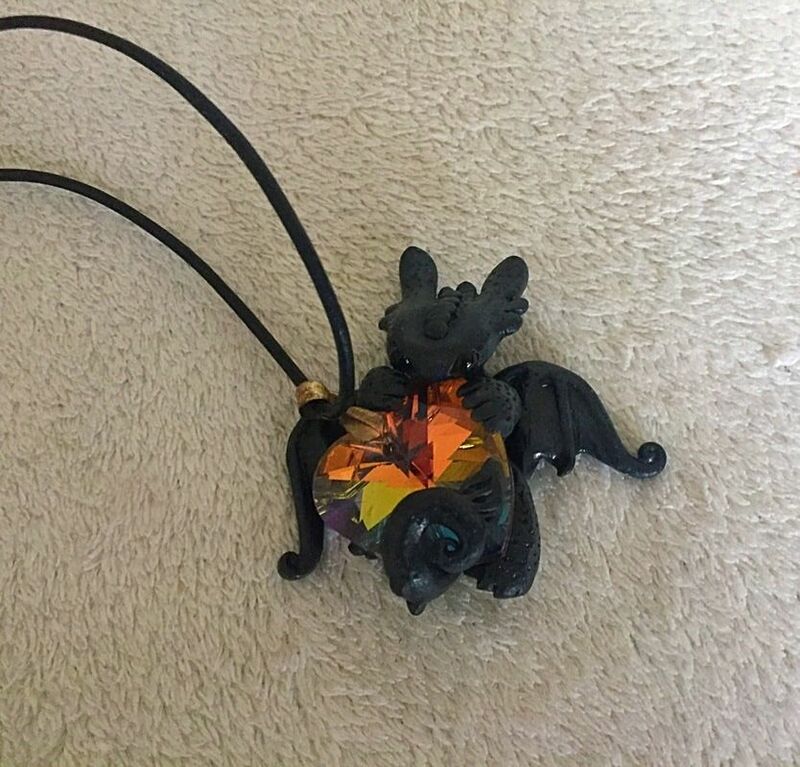 He's unusually small for these kinds of bootlegs, and of course lights up like a Christmas tree having a seizure. He's also got random racing stripes, but only on his wings. And, uh, a skull tattoo on his chest. I hope he doesn't regret that later on! For once, something I'm actually going to use! It's that cool. This guy is a bootleg all the way from Mexico! He's not actually bad looking, and could pass for a low-quality official item. I'm actually pretty happy to welcome him to the hoard, considering I usually hate bootlegs and only bought him for the novelty! Also, he's amazing. He had this weird white plug-lookin' thing and I thought it was just typical trashy bootleg quality, but it makes him light up like crazy, with three different flash settings! Another bootie from Mexico! This guy is lovelier because of his mega glow, which is my favourite thing ever. He's also huge. And he flashes violently like the one above! 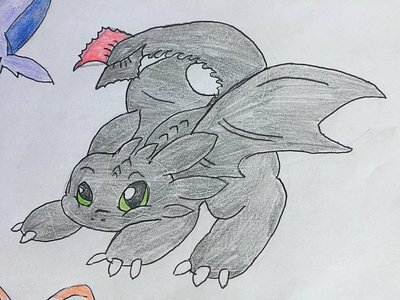 Come to me, my cute lil Night Fury babies! These came free with another purchase, and I must say that I'm really loving them. Very cute! 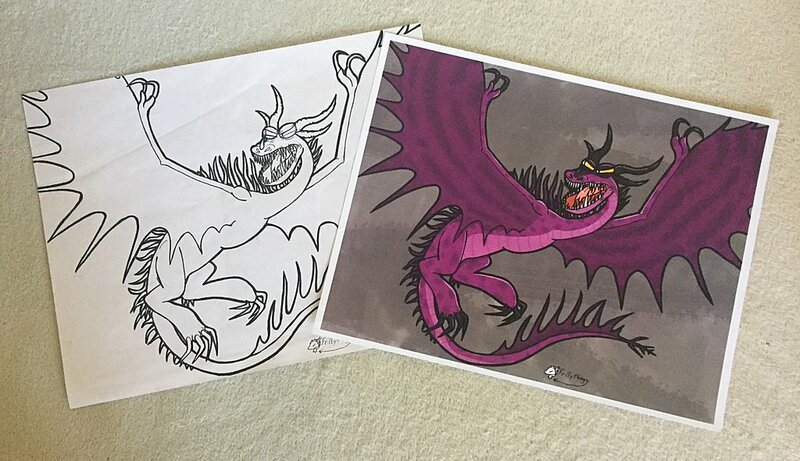 I like the colour differences, too! Croc charm imitations. Very nice ones though! And since there's no official alternative, I will gladly accept these into the collection! The Vikings' eyes are super freaky though. But cutie Hookfang makes up for it!! That, and ginger!Astrid is the most amazing, awful mistake ever. You can never have enough necklaces! 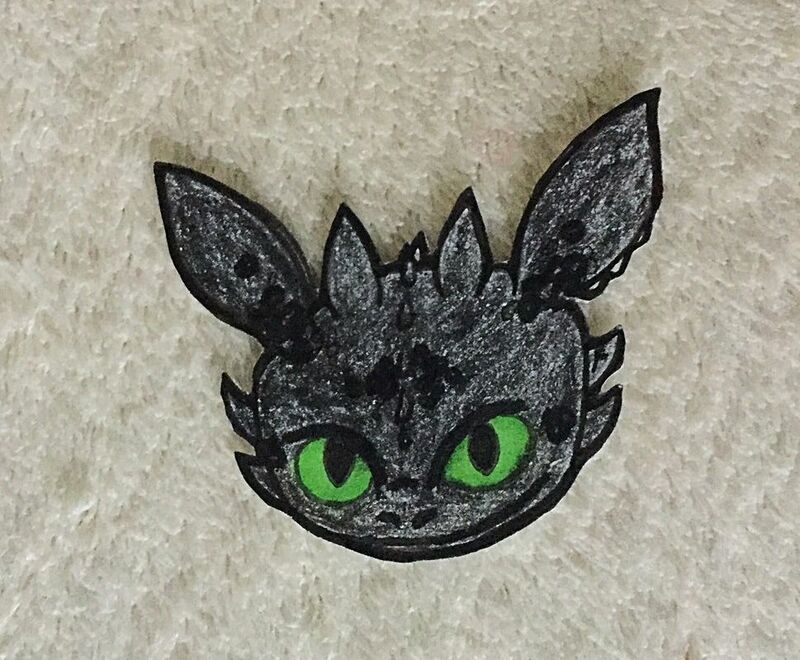 This time we have a lovely pendant of Toothless' creepily cute face again! 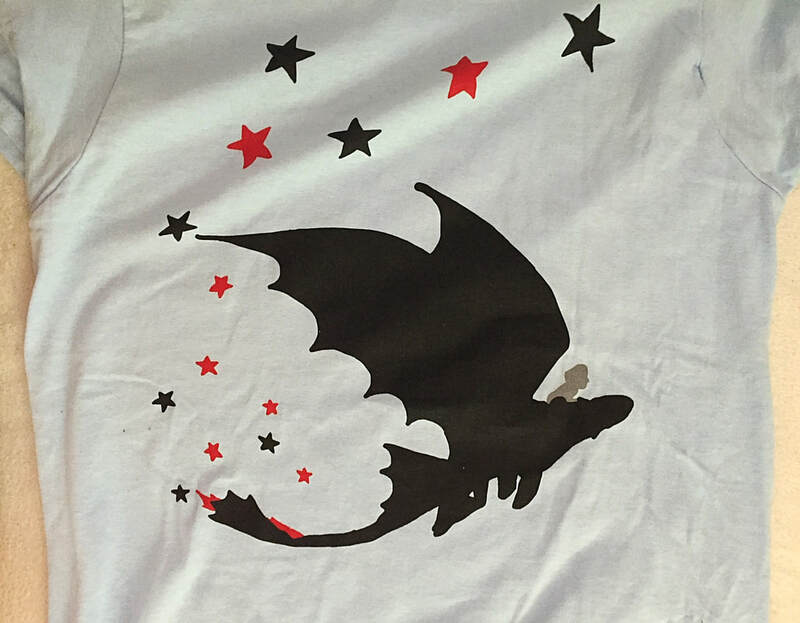 I wear this out and it makes people go 'IS THAT A TOOTHLESS?' so he certainly turns heads! These Toothlesseses are just so cute! This guy's smaller and lighter, and has a little blue fishie! He's also faintly glittery which is super nice. I don't really aim to have much fanart in my collection, but I usually pick up or commission some nice pieces at Comic Con if I have the chance. A few of these are gifts, too. All of these prints are unique and incredible; so nice to look at! A friend of mine said this wasn't really her thing, so she graciously gave it to me, and I love it! 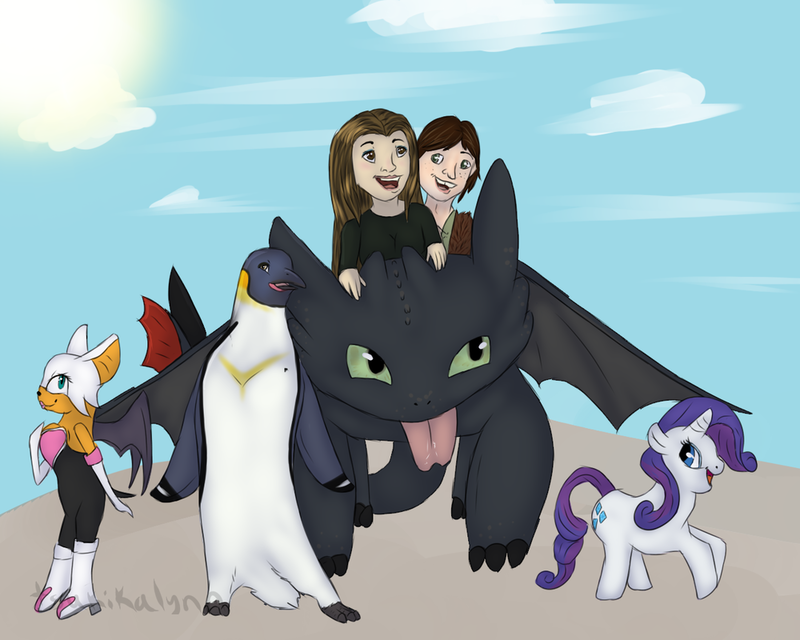 I love HTTYD (obviously), and I really enjoy Game of Thrones too! Tyrion is my favourite character, but Daenerys is a close second! 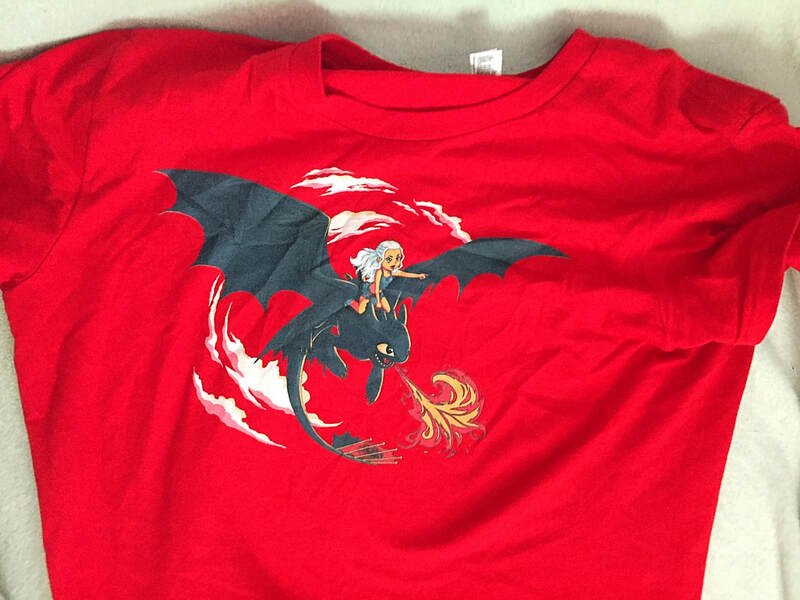 Of course this crossover had to be done, Daenerys is the mother of dragons, and Toothless is.... a dragon. It's perfect! The art is beautiful, too! 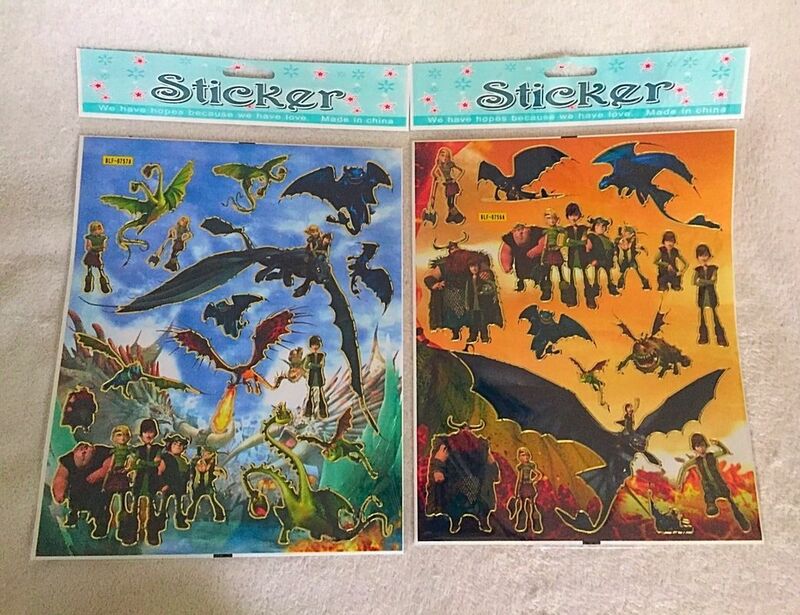 Aggressively bootlegged stickers. I love them. 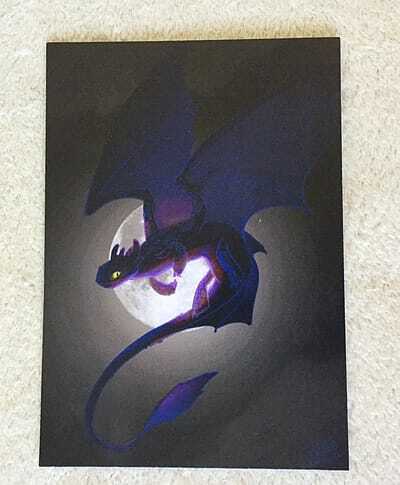 I commissioned an artist who offered a free mystery sticker every time you bought a print of your commission too. I commissioned two pieces of art, neither HTTYD related, but the artist kindly chose Toothless to be one of my mystery stickers! 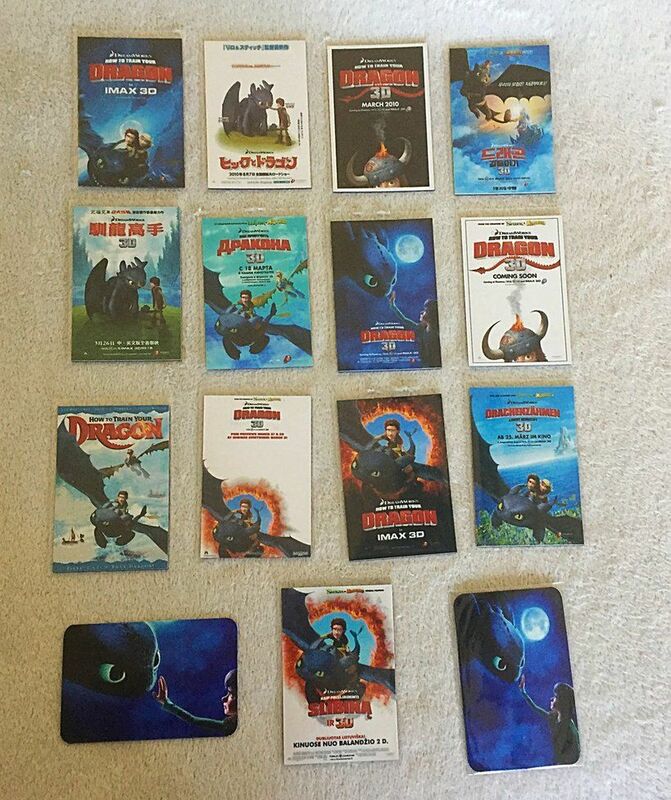 I mean, I know it's obvious how much I love HTTYD, but it's still a lovely choice! This guy is hand drawn too - not printed - so he's one of a kind! Lookit his cute lil face! I'm not typically a buyer of bootlegs, but oh my God I couldn't resist these. Each one is like a catastrophic masterpiece. 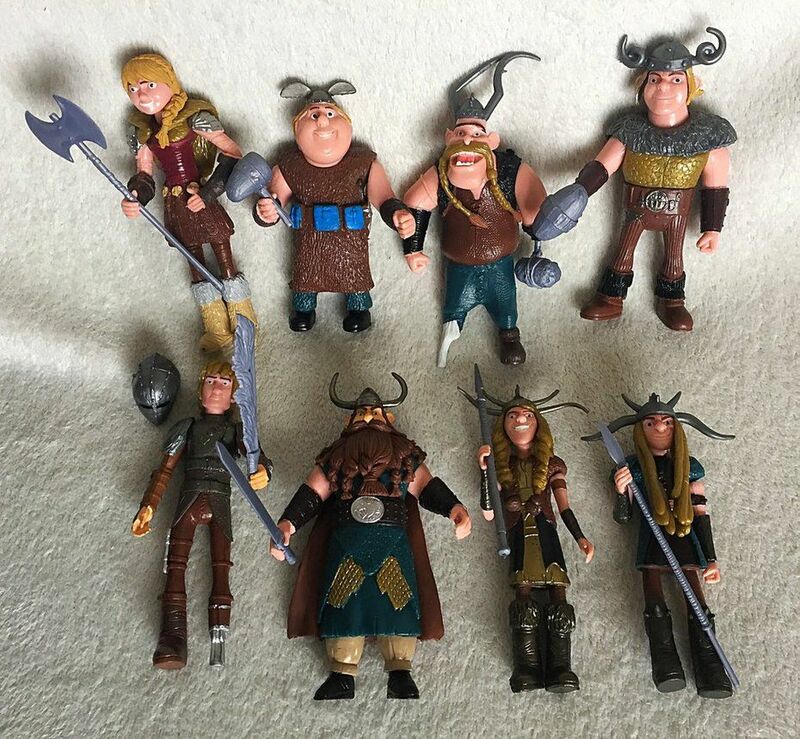 They're all blond(e), except for Stoick, for one. Astrid has got the dead-eye stare of a fish. They are probably dripping with lead. Stoick has a head that is a different colour to his arms. The horns on Gobber's helmet. Amazing. But hey, a Stoick figure. And Ruffnut too! 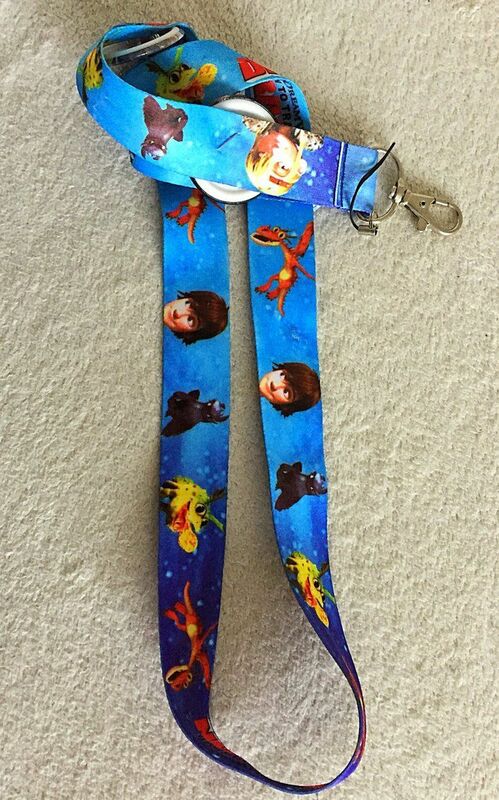 I just found the cheapest, tackiest lanyard on all of eBay to pin my badges to. It still looks kinda nice though! 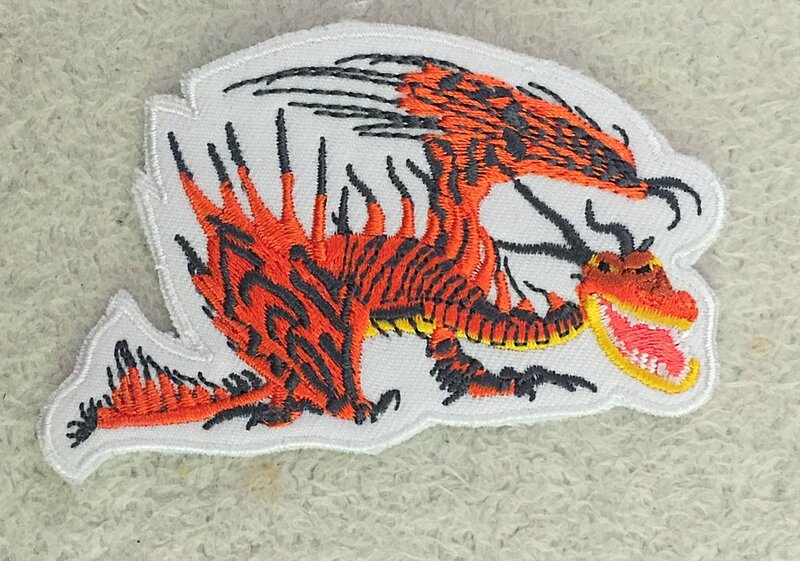 An iron/sew on patch of the cutest creepy smile ever. 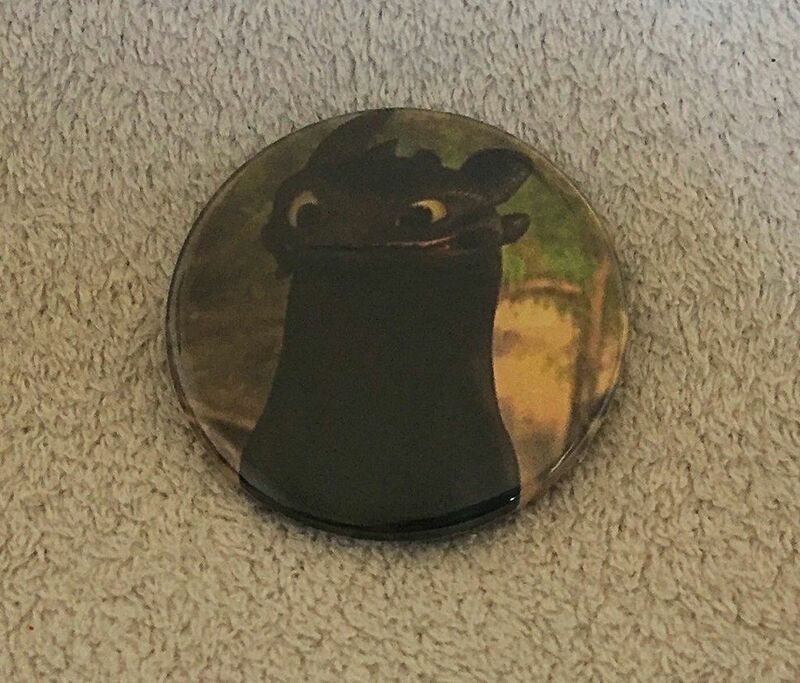 A big button badge of one of the cutest dragons ever! This was too cute and amusing to pass up! 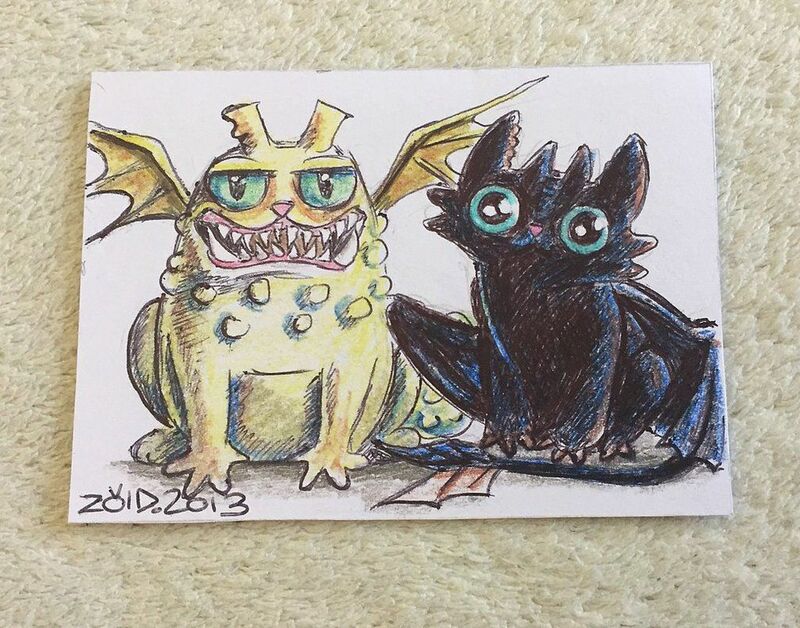 That Toothy cat is so cute too, with his big round eyes! 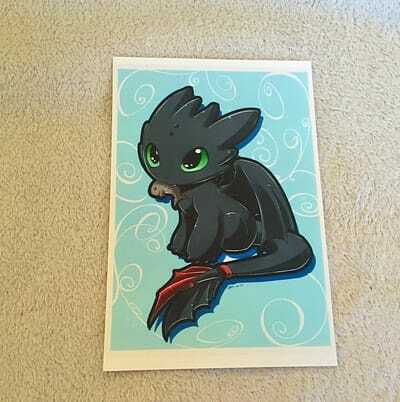 Isn't it weird how it still looks a lot like Toothless? 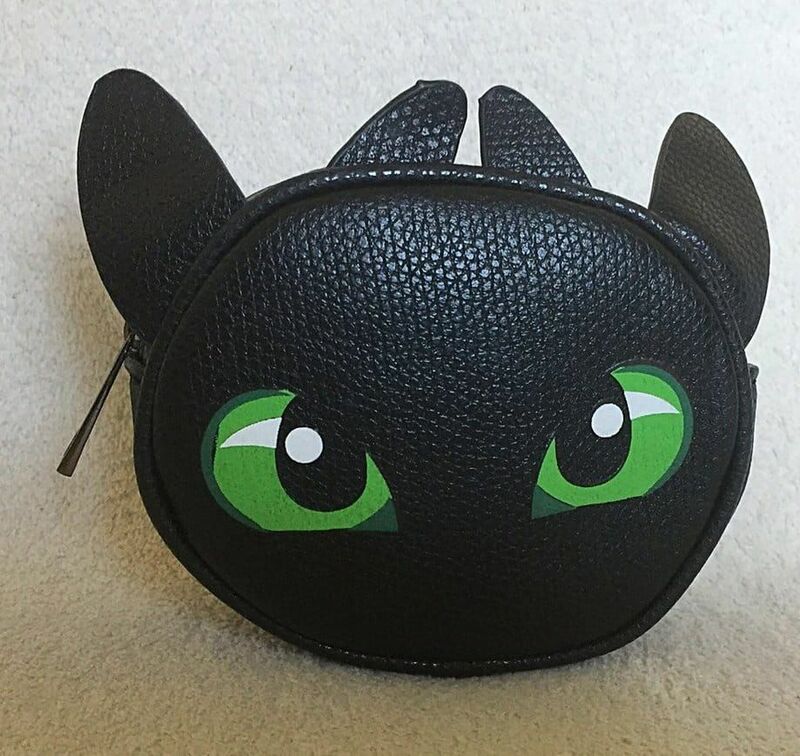 Like literally, get rid of the cute pink nose and that is Toothless. ... I have no comment on Groncklecat. This one was a present! 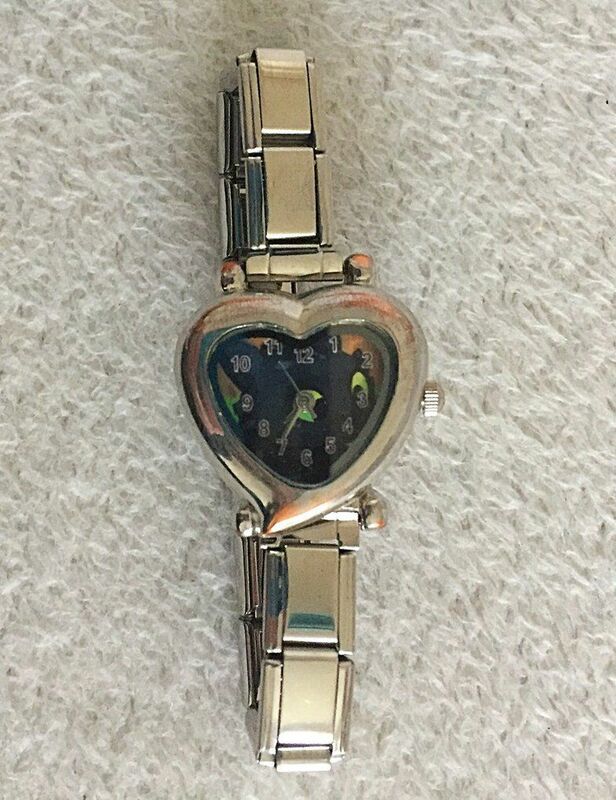 It's a cute little watch with Toothless' face on the face! This was a random freebie with my calendar. 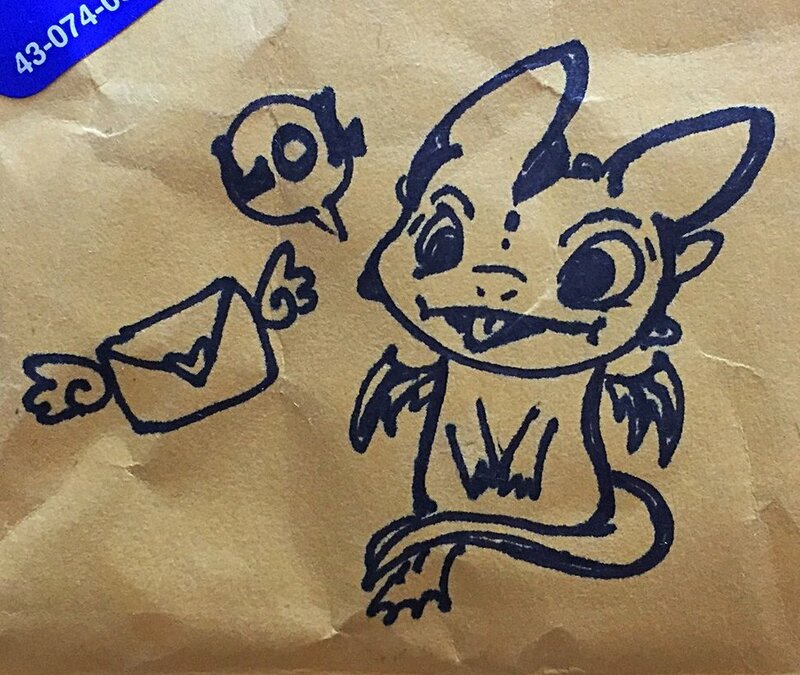 It's cute though, especially Meatlug's little face popping up at the bottom! What a unique item! It's very professionally m﻿﻿ade, too. There are 10 playable characters; 5 for each side. 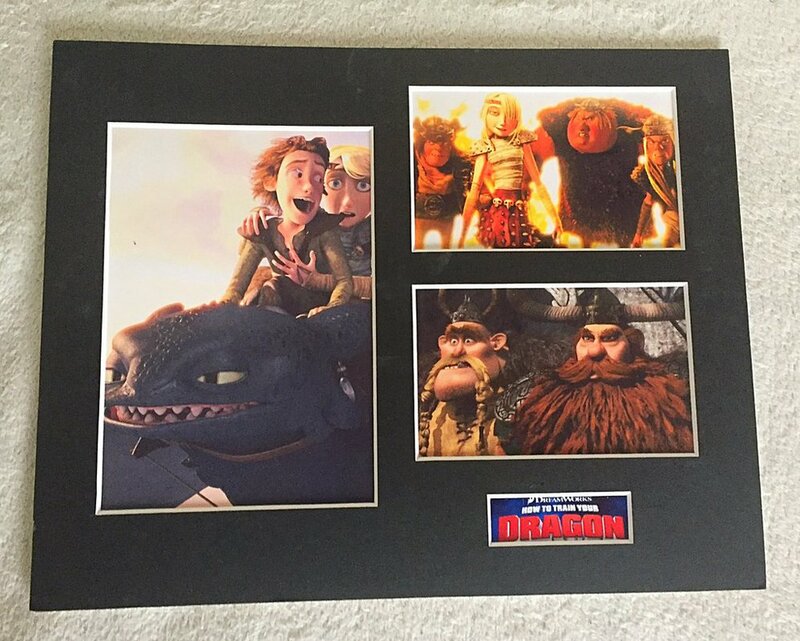 There's the dragon team and the Vikin﻿﻿g team! 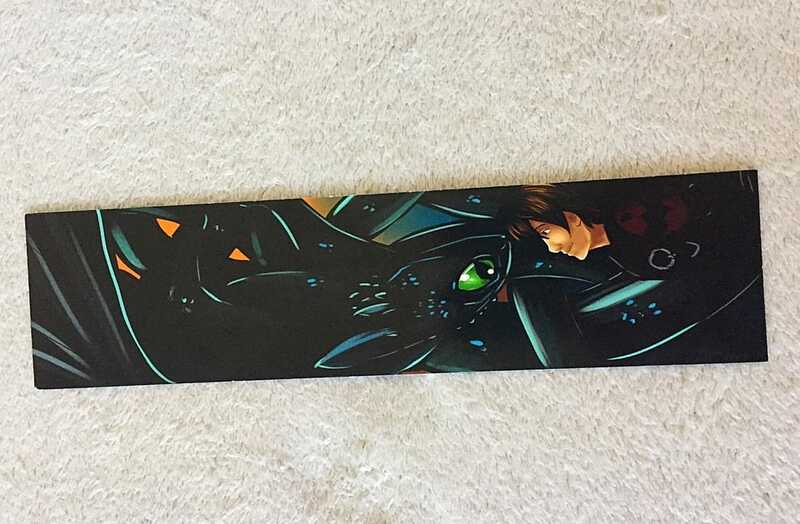 My friend got this for me on my 21st! 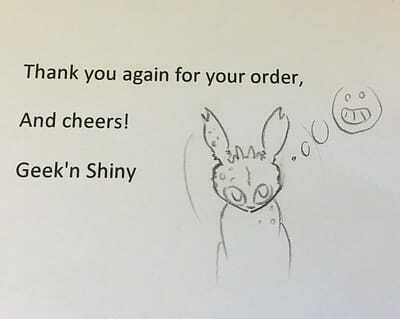 He didn't draw it or anything, but oh gosh I love it! 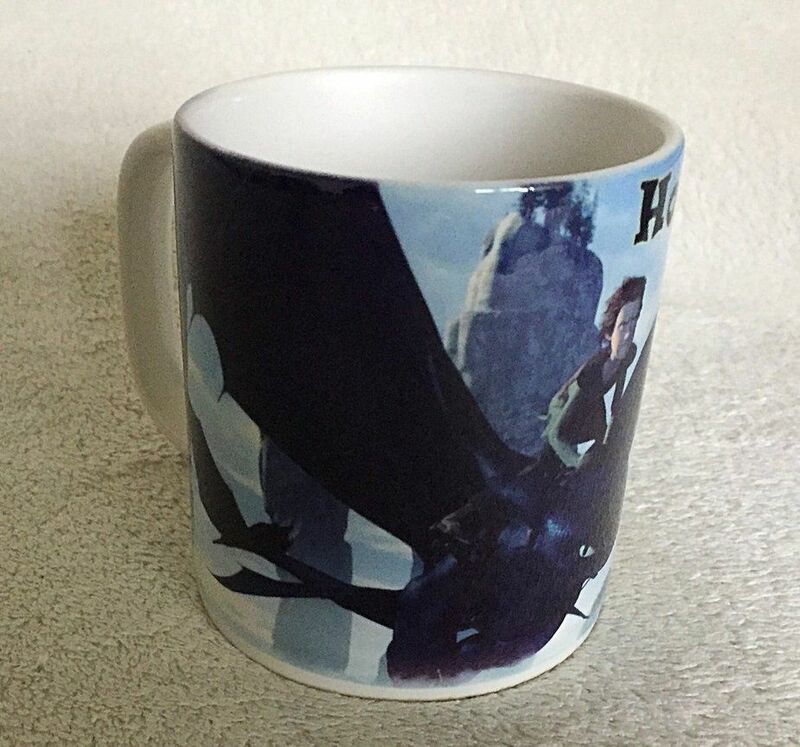 A mug printed for me! I love it too much to use it! 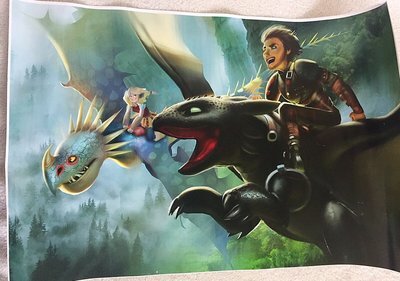 I got these because I didn't have any room for displaying full-sized theatrical posters, but reeeeally wanted some on my wall because HTTYD has the best poster art! 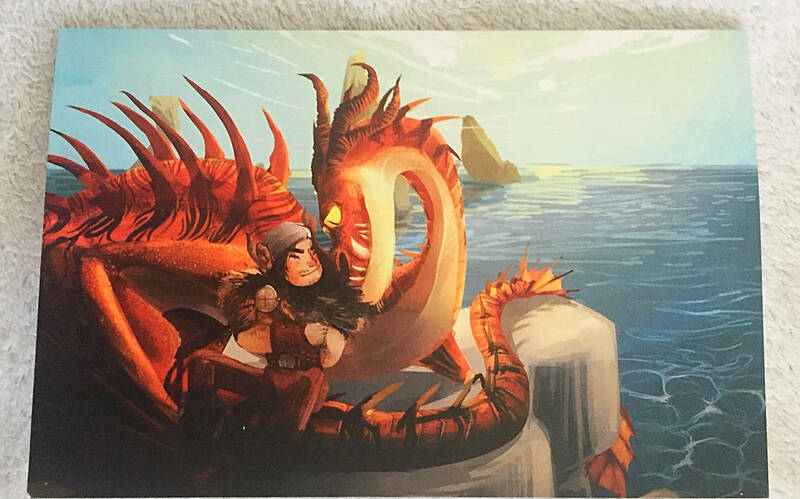 They're high quality too, printed on glossy photo paper. Most of these magnets are just prints of theatrical posters from around the world. I thought it'd be a nice way to appreciate poster art without having to buy a million posters! There's also a landscape and portrait magnet of a text-less version of my favourite "moonlight" poster. I got this at Collectormania years ago! It's kinda plain, but has some nice glossy pictures on it. Lots of doodles and sketches, from myself and from others! I can't photograph them all!